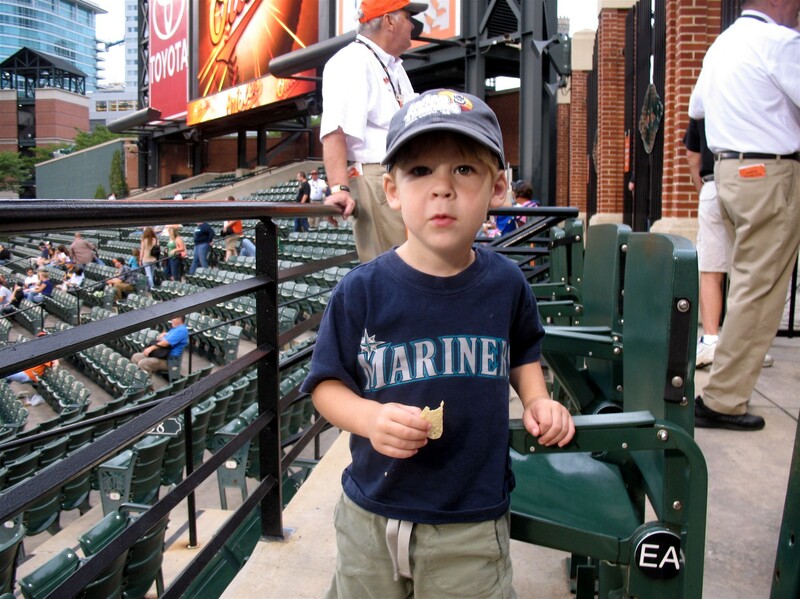 …we bought tickets in straight away centerfield — where Tim enjoyed some nachos before the game got underway. None other than my favorite baseball player of all-time, Mr. George Kenneth Griffey, Jr., was in town. 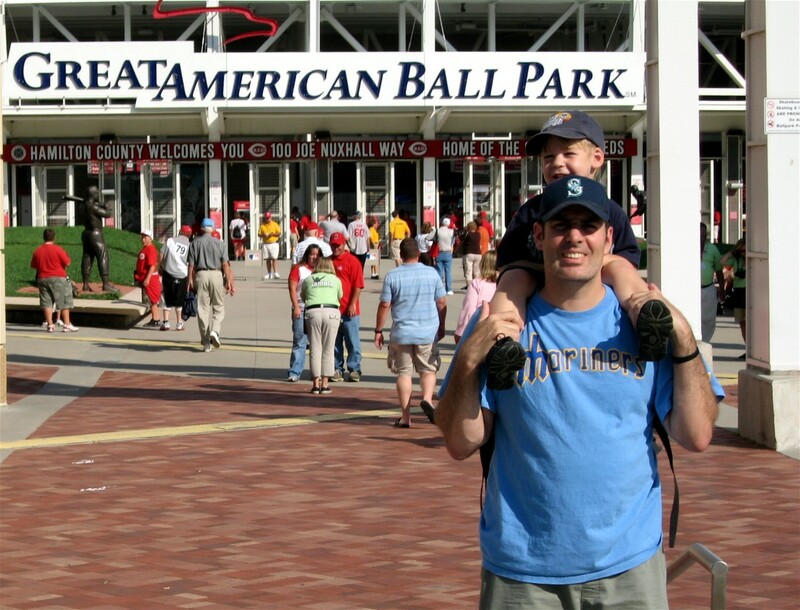 After two failed attempts (here and here) to see Griff play for the Reds, this was the first time Tim ever got to see Griffey play the great sport of Baseball. 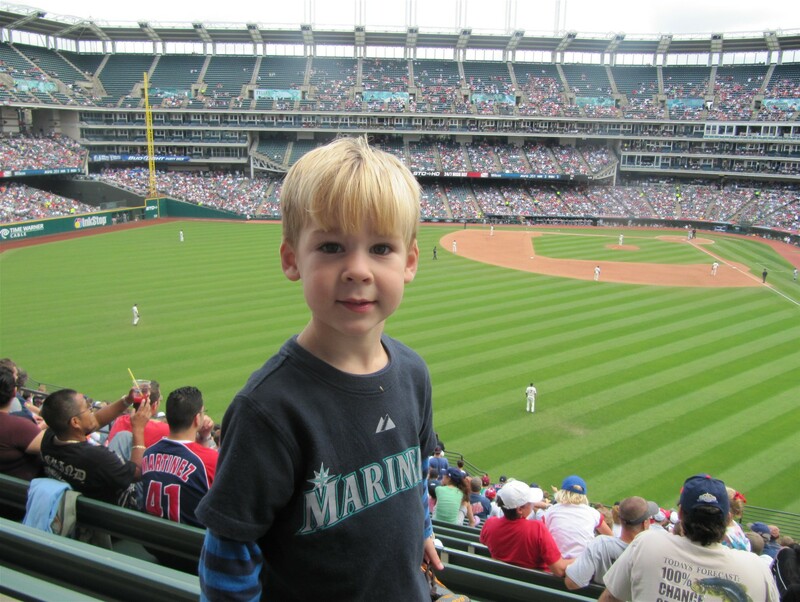 And it may well be the only time he ever gets to see Griffey play centerfield. …(i) Tim was excited and (ii) we had seats in the first row! 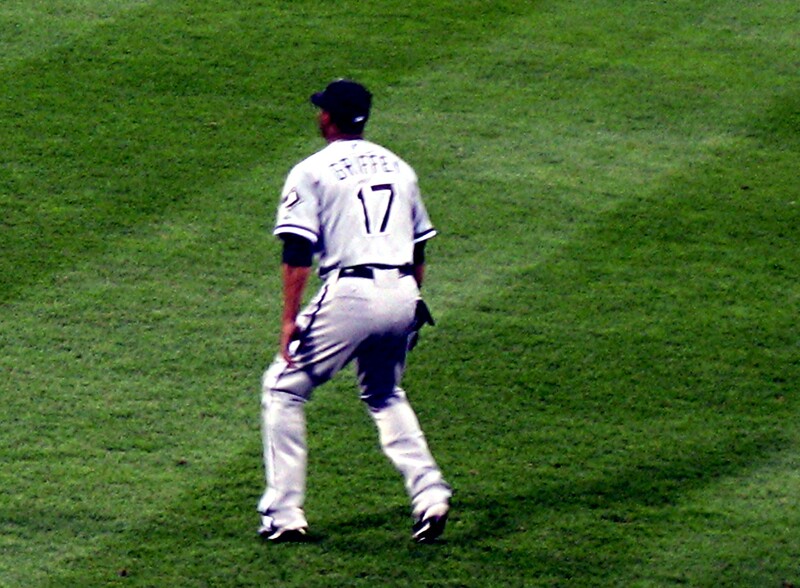 …despite the White Sox uniform, isn’t that beautiful? Actually, the White Sox uniform is a beautiful sight too. 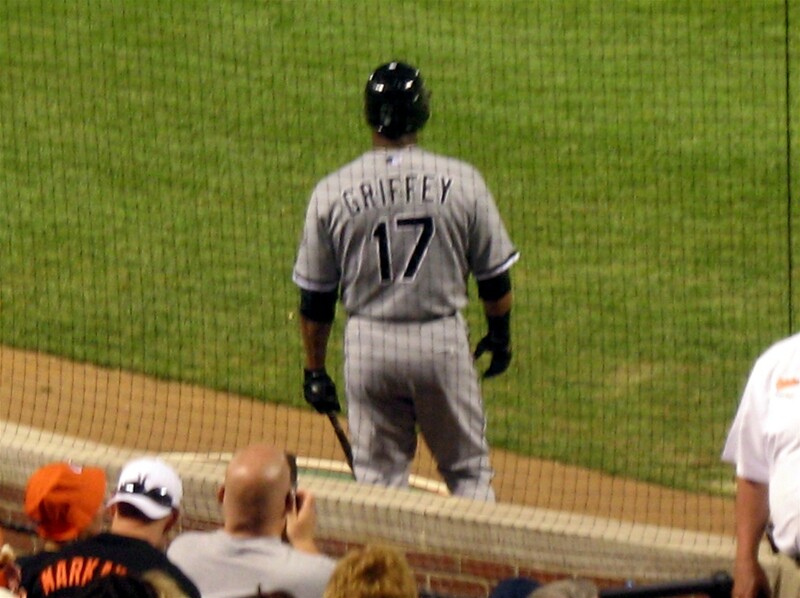 Because when I learned (about 26 days before this game) that Griffey was going to be wearing number 17 for the White Sox (despite the fact someone had offered him number 30), I was incredibily happy. To me, that was a huge sign that he didn’t plan on sticking around with the White Sox after playing out the last two months of the season in the south side of Chicago. That meant one thing to me: he was going to come home to Seattle. It was awesome to get to see Griff play centerfield again. And he had plenty of action during this game — he made 5 put outs in his traditional outfield position including a catch just a few feet away from us on the warning track on the Orioles’ first batter (Brian Roberts) of the night. I love taking Tim to see Griff play. Its like sharing a piece of my own childhood with my boy. 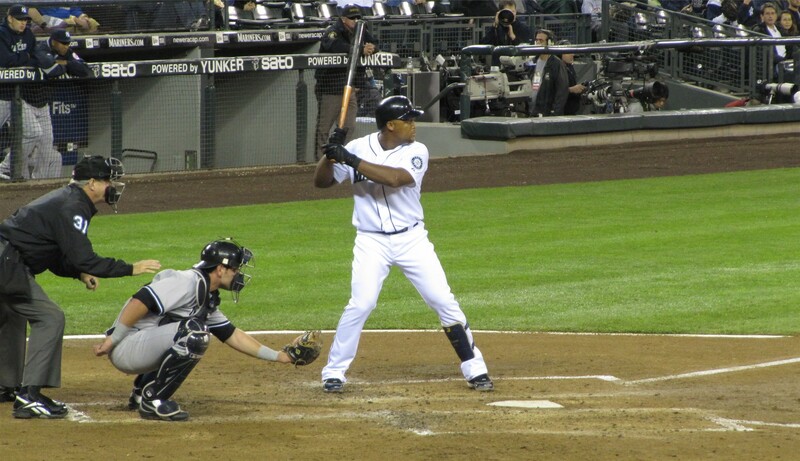 And it was awesome to be sitting right behind him as he manned centerfield like he did throughout his days in Seattle. Actually, in that last picture, he is shifted over toward LF for the batter. Usually, he played closer to us than he is in that picture. Griff made direct eye contact with this sign several times. He has a masterful poker face as he stares into the crowd so he in no way acknolwedged the sign. But he looked directly at us several times as we politely held our sign delivering a very important message on behalf of the people of Seattle…and Mariners fans everywhere. By the way, see the red circle at the top of the sign? 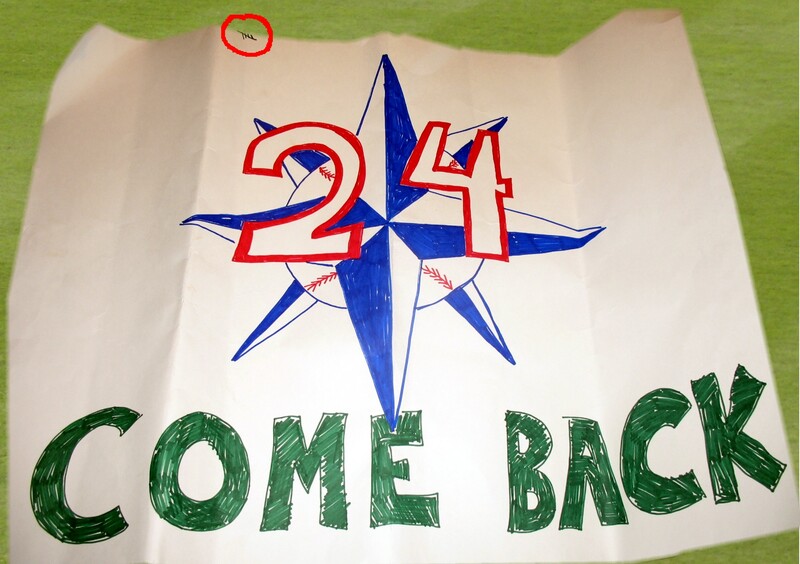 That circle is around five tally-marks that I drew on the sign to count Griffey’s catches in centerfield. Tim still liked it. But, really? Dove chocolate covered ice creamcicles at a ball game? Really? Not cool, Orioles. Pretty much our game plan for this game was: (i) watch Griff play CF from the CF seats, (ii) play around in the flag court, and (iii) watch Griff hit from behind home plate. …as Griffey stands on first after his second walk of the night. Griff had his only official “at-bat” of the night in the top of the sixth inning. 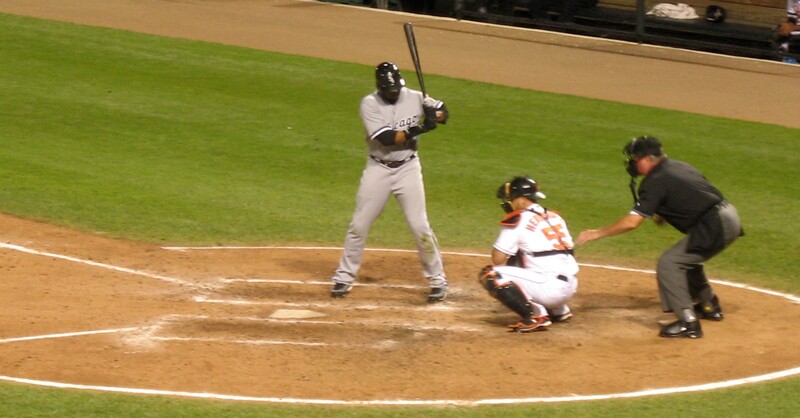 With a runner (Paul Konerko) on first and one out, Griffey did his job by hitting behind the runner and advancing Konerko to second on a ground out to first. 0-1, 3 BB, 5 defensive put outs. Not too shabby. And so, with Griff eventually being stranded on first, we took off. The next time we would see Griffey, we’d be in Seattle and he would be a member of the Seattle Mariners. Yes! 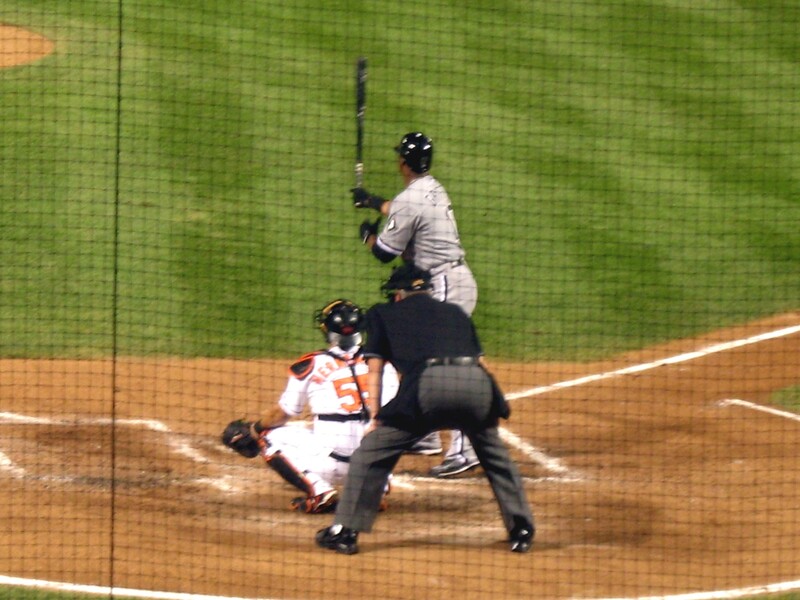 As for the rest of the game, the Orioles pounded John Danks and the White Sox by a final score of 11-3. 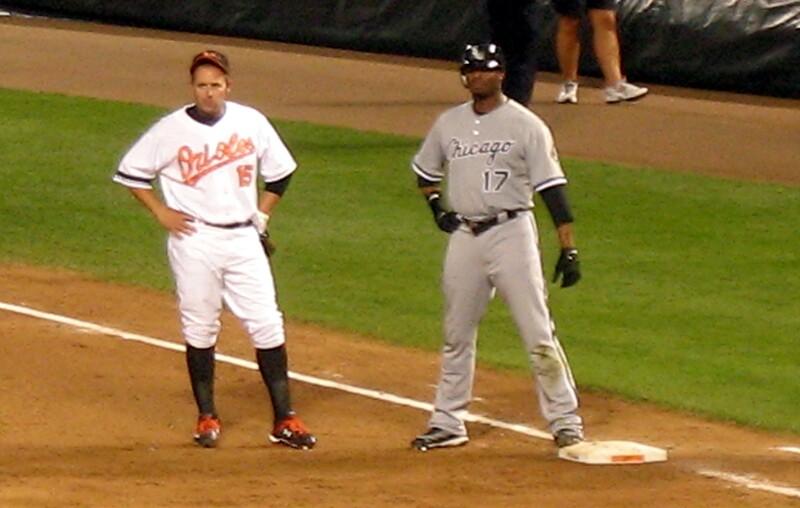 There were five homeruns in the game: Jermaine Dye, Paul Konerko, Kevin Millar, Aubrey Huff and Melvin Mora. Also, I love that the author mentioned Rick “The Peanut Man” Kaminski and Kid Sensation a/k/a Xola Malik. 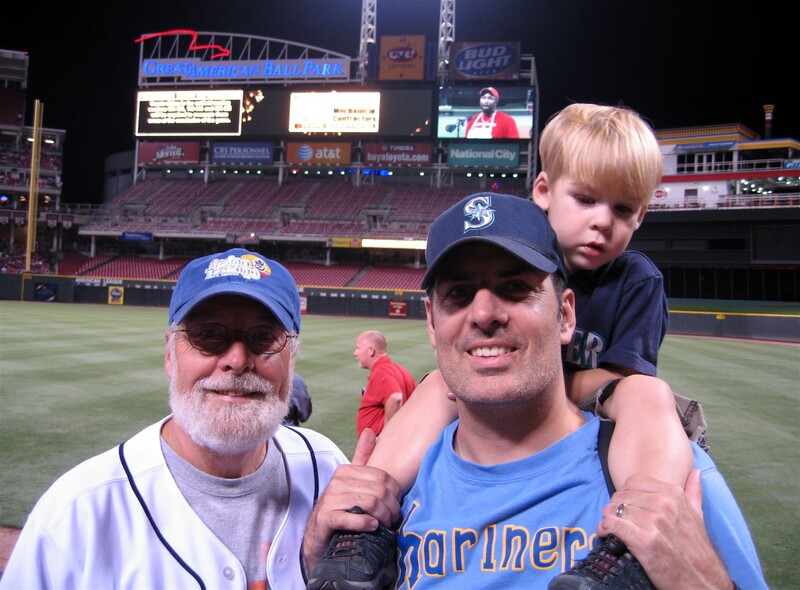 Last August, I did an entry summarzing The (First Annual) Great Cook Grandfather-Father-Son Baseball Road Trip. The purpose of doing so was to give some background and context for the Second Annual Roadtrip that took me, Tim and my dad through Chicago, Minnesota and Milwaukee in August 2009. Those entries were just a combination of emails I sent to family members while we were on our first roadtrip. Now, its time to do actual game updates for those four games. After I got off work on August 14, 2008, my dad (Jim), Tim and I packed into the car and drove to Washington, Pennsylvania where we spent the night at a KOA. 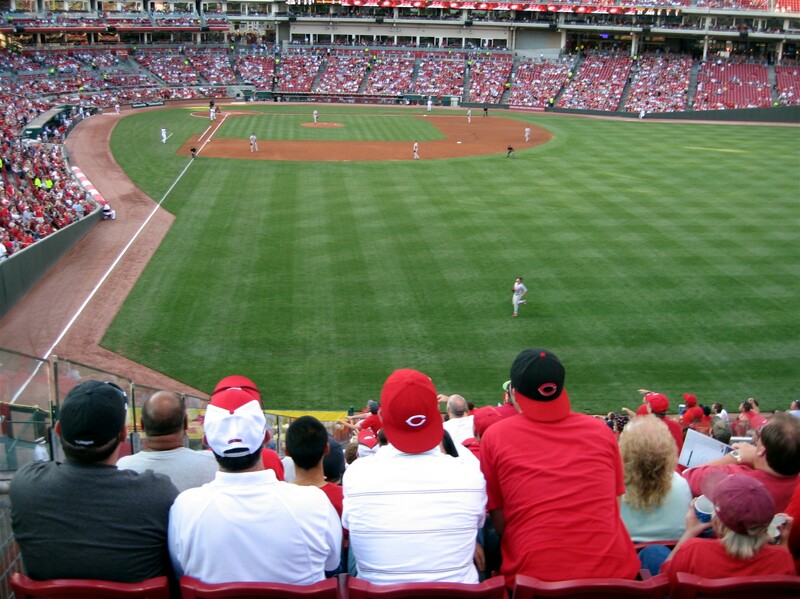 Over the next five days, we would visit Great American Ball Park in Cinncinati, the Louisville Slugger factory in Kentucky, Progessive Field in Cleveland, PNC Park in Pittsburgh, and Citizens Bank Park in Philadelphia. …as my dad packed his stuff, Tim stomped around the campground exploring and hit some whiffle balls off of his Tee. 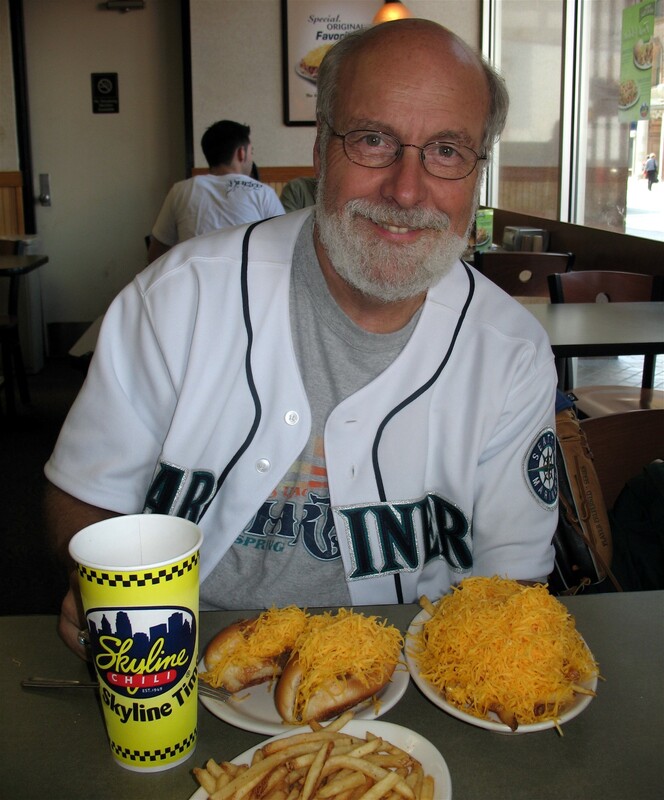 …Skyline Chili was right on the way as we walked from our hotel to the ball park. If you like cheddar cheese, this is the place for you. 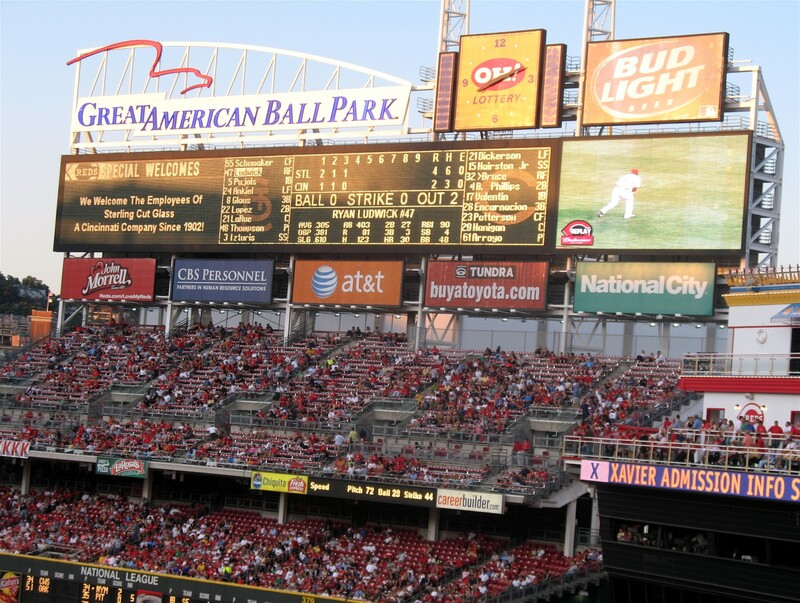 …and Great American Ball Park. 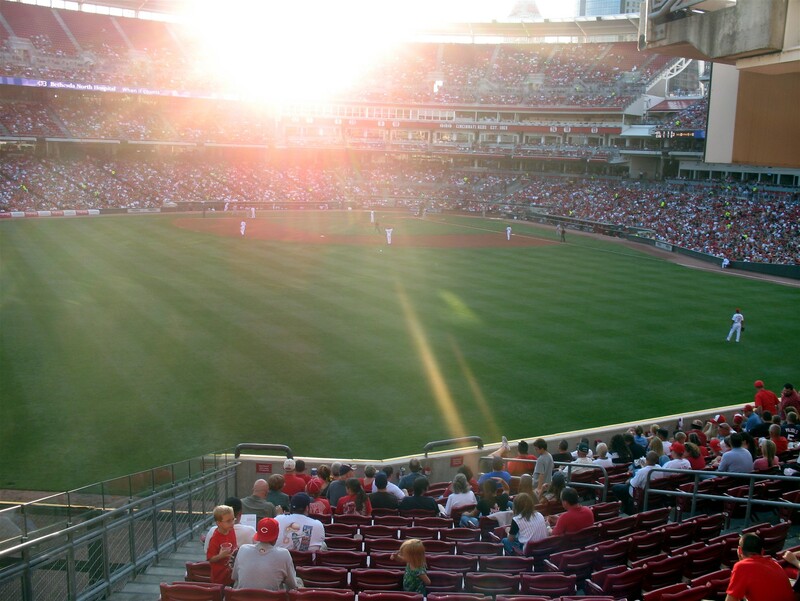 Now, in the grand scheme of all of the new stadiums, I had heard that Great American Ball Park was nothing special. But, you know what, I really liked it. Its no Camden Yards or Safeco Field, but it had a special feel of its own. In fact, I almost felt like it was a Major Leauge size minor league ball park. That’s not meant to be insulting. What I mean is that it sort fo felt *quaint* — maybe it was because we sat in the RF bleachers with the big steam boat nearby in CF and the river behind us. Anyway, I liked it a lot. …and practiced his power stroke. 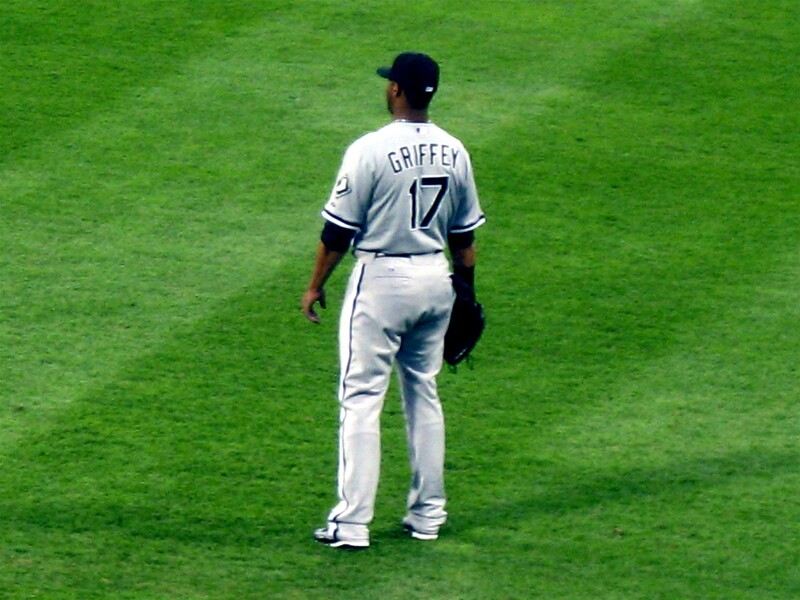 Sixteen days before this game, Griffey was traded to the Chicago White Sox. We’d planned to sit right behind him in RF. By the way, I didn’t write an entry about it because Tim wasn’t with me, but after missing seeing Griffey’s 600th homerun in Philadelphia, a buddy from high school and I saw Griff’s 601st homerun at Yankee Stadium during interleague play. …a few minutes later, Volquez walked into the Reds dugout just below me and Tim. All I had on me was a cheap plasticy ball we bought on our way to play catch with on the trip. Anyway, Volquez and some other unidentified Red signed it. 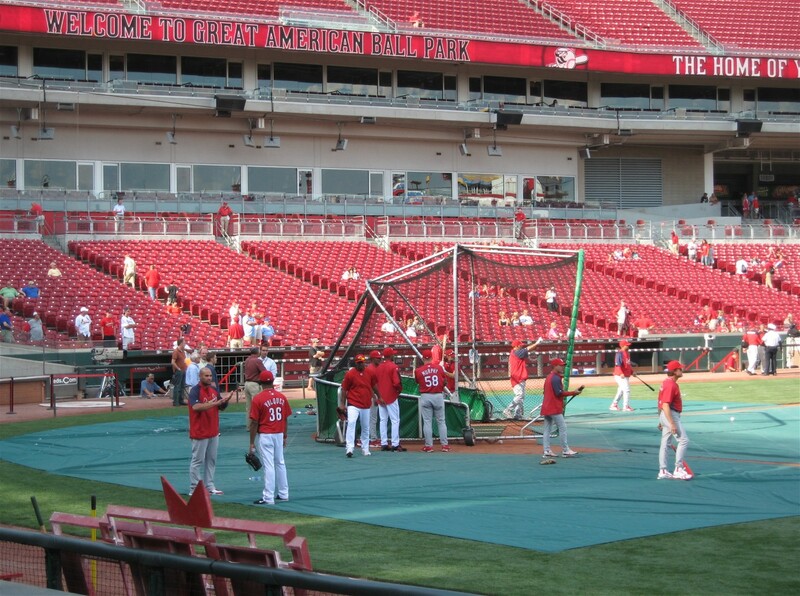 We headed out to the seats in RF to watch some BP. It was pretty packed out there. Tim and I squeezed into the first row and my dad hung back a row or two behind. We were having no luck. Then, on what I think was the final pitch of BP, someone hit a ball off the wall right in front of us. As it bounced off of the wall, all of the Cardinals started to run toward their dugout. 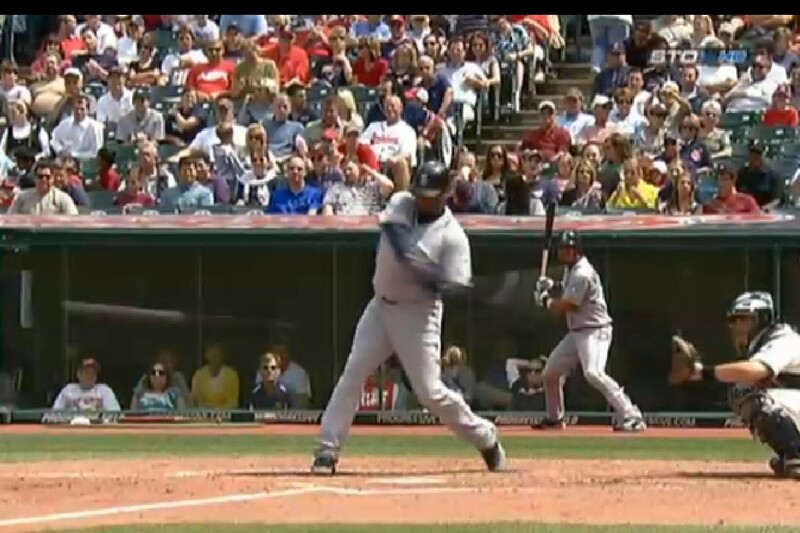 But reliever Chris Perez turned around to grab that ball. He grabbed it and started running back toward the field. Then everyone yelled at him. He turned around. The 20-something guy next to us and I both pointed at Tim. Perez fired the ball over to us. It was the first ball Tim had got this season. As Team Halls of Fame go, this one probably sets the standard. It is excellent. 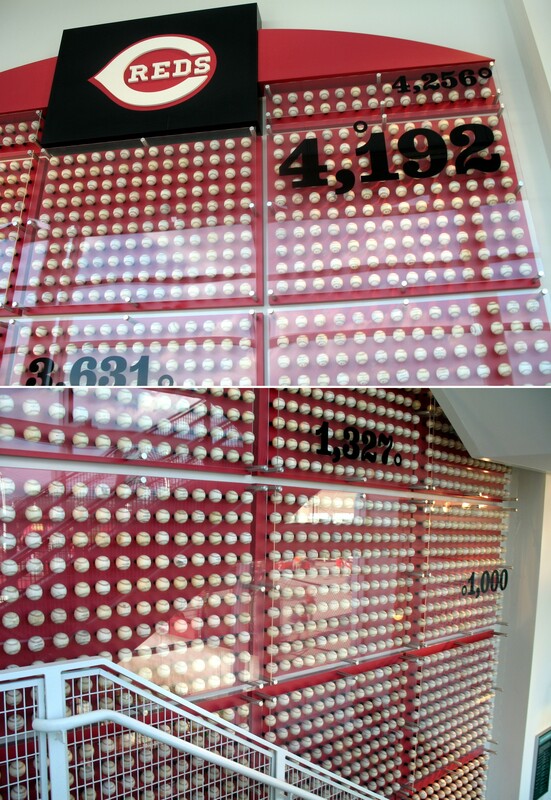 Along the far end of the Reds HOF (closest to the outfield and Ohio River), there is a wall of 4,256 baseballs representing Pete Rose’s record-setting career hit total. The balls cover the wall the entire way as you ascend three flights of stairs. If you click on that picture to enlarge it, you will see that the balls are all game (or at least BP) used. They are all dirty and scuffed with bat marks. Its an excellent visual representation of Rose’s hit record. 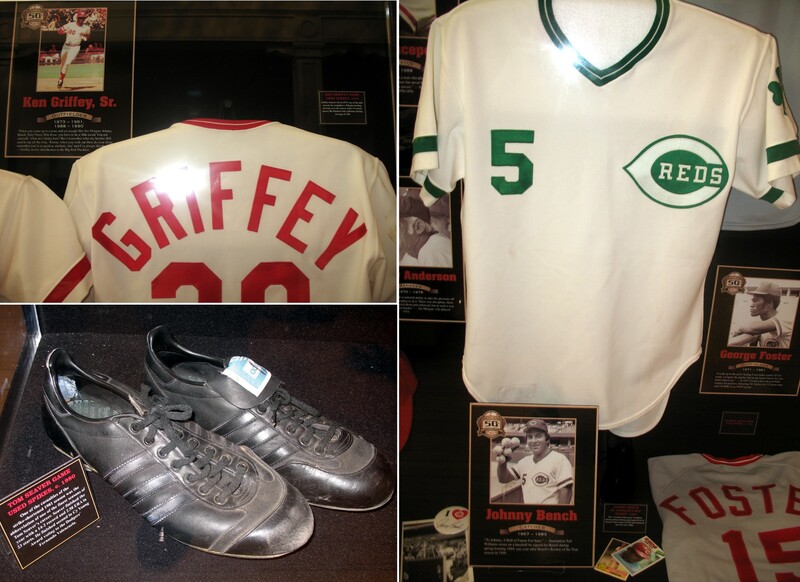 The Reds HOF is packed with jerseys, bats, gloves, and shoes with little descriptions of the Reds Hall of Famers. I was happy to see a Ken Griffey, Sr. jersey in there. I’m a big proponent of team Halls of Fame. I think the Baseball Hall of Fame should be reserved for the super-elite, best of the best of the best of the best. 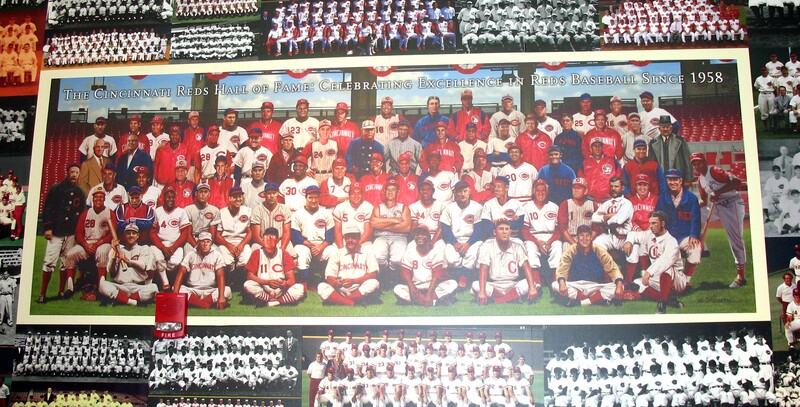 Some peopel refer to “inner circle” Hall of Famers. To me, the “inner circle” should be the entire Hall of Fame. If a player is borderline, if an “argument” mut be made for a player’s candidacy to the Baseball Hall of Fame. I think that means that player is not a Hall of Famer. But that doesn’t mean there is no place for such players. If a player can’t make the Baseball Hall of Fame after years on the ballot. No problem, those players can still be remembered forever by the people to whom they were most important in their respective team’s hall of fame. Anyway, those are my two cents. 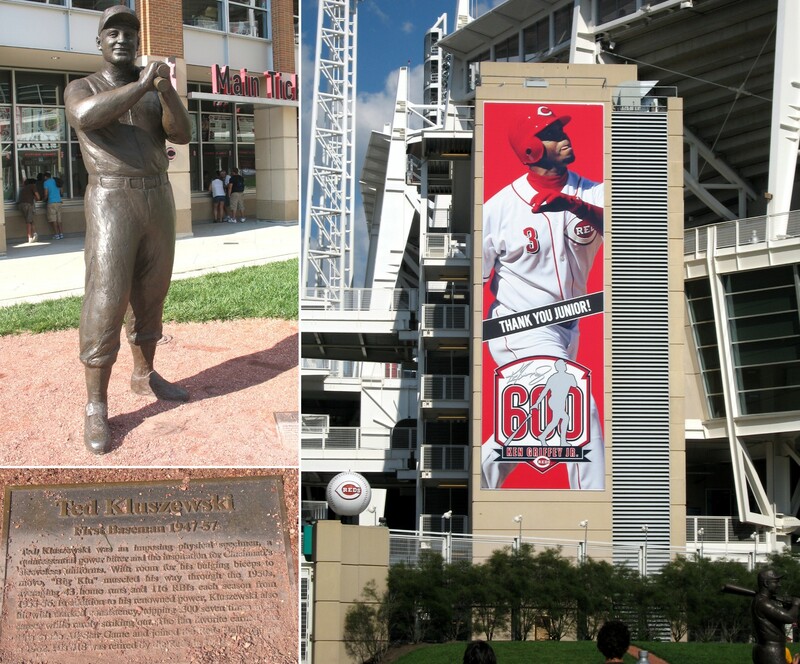 And anyone lucky enough to make it into the Reds HOF should be very pleased, indeed, this place is spectacular. Do you see Ken Griffey, Sr! He’s almost right in the middle. 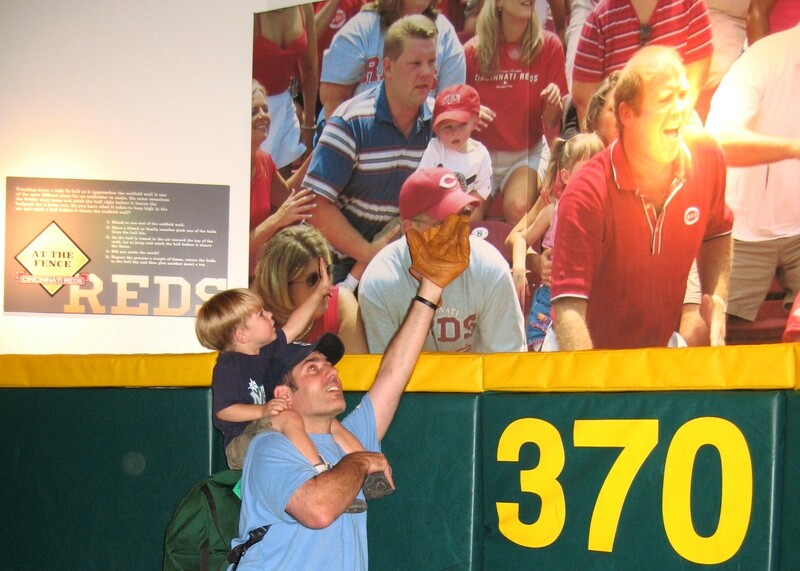 And he’s not just in the Reds HOF, we’ll see him again before the end of this entry. 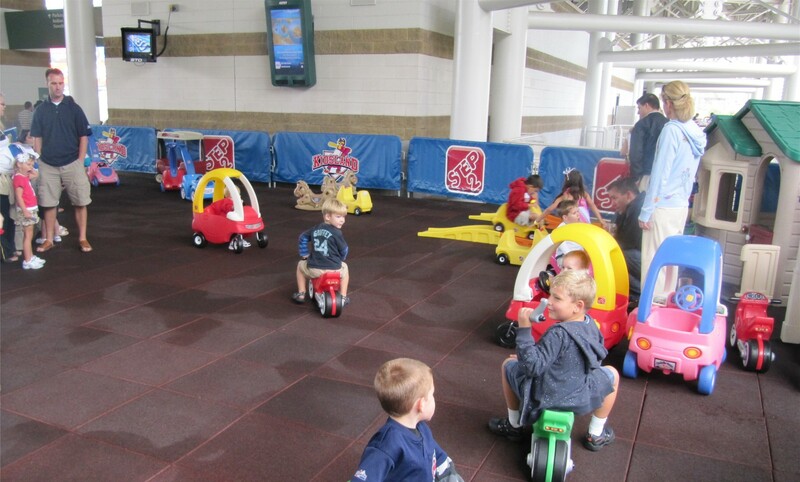 …they had a little kids club house type area with little lockers with little jerseys they could wear and slides and things to climb. 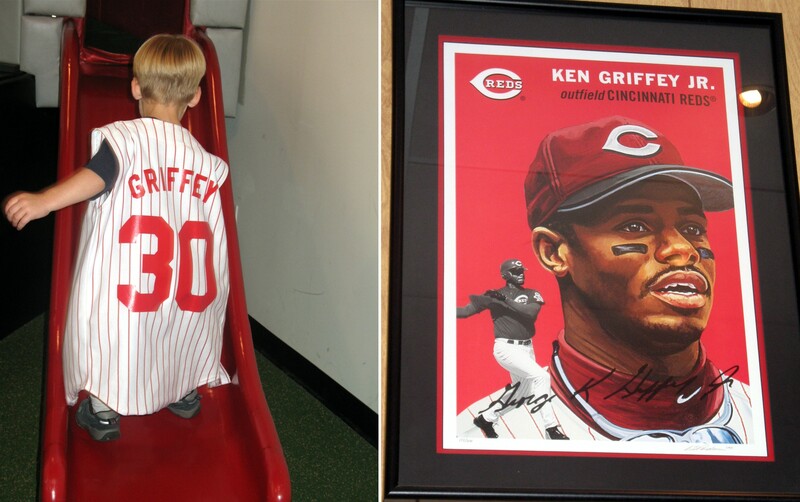 In another area, they had a mock *man cave* full of stuff the ultimate Reds fan my have in his den. 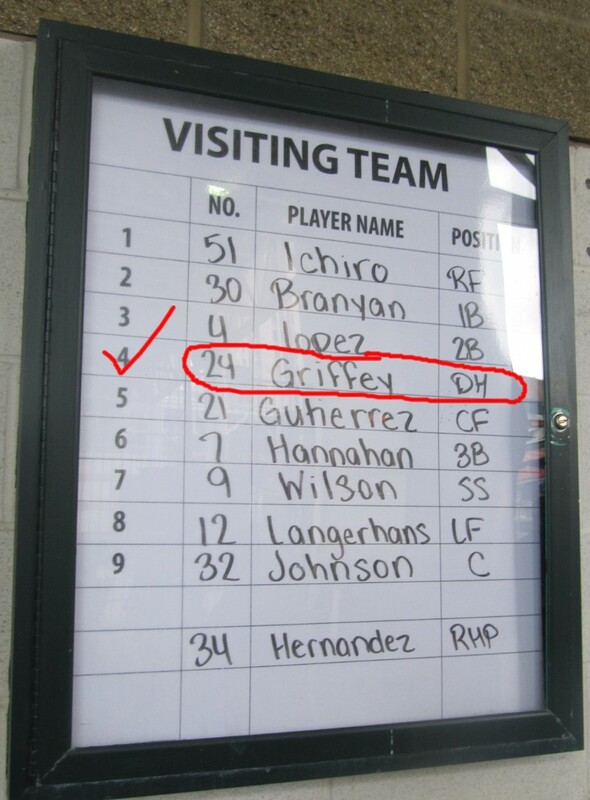 Check out this picture of Ken Griffey, Jr. Notice anything odd? He signed it “George K. Griffey, Jr.” I have never seen him do that before. Soon, it was game time. I took this panaramic view from our seats in RF. 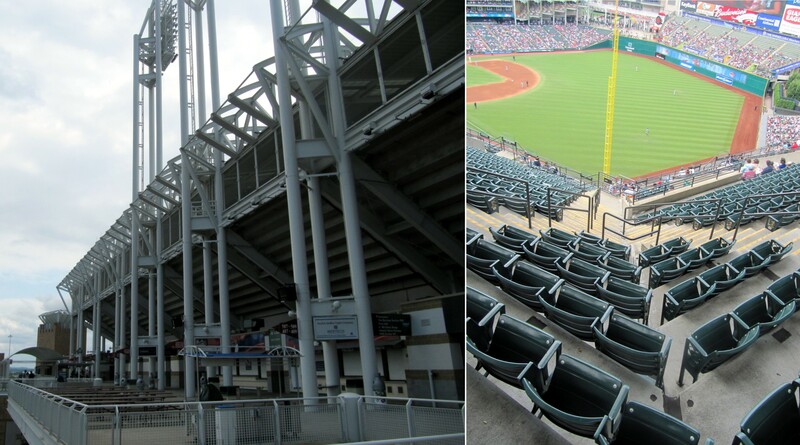 I bought these tickets literally the second they went on sale…in February or March or 2008…and the best they could give us in RF (where I was hoping Griffey might hit a homerun) was 3 rows from the top of the bleachers. In to top of the first, Pujols popped out. But the Cards scored two runs on a homerun by Rick Ankiel. 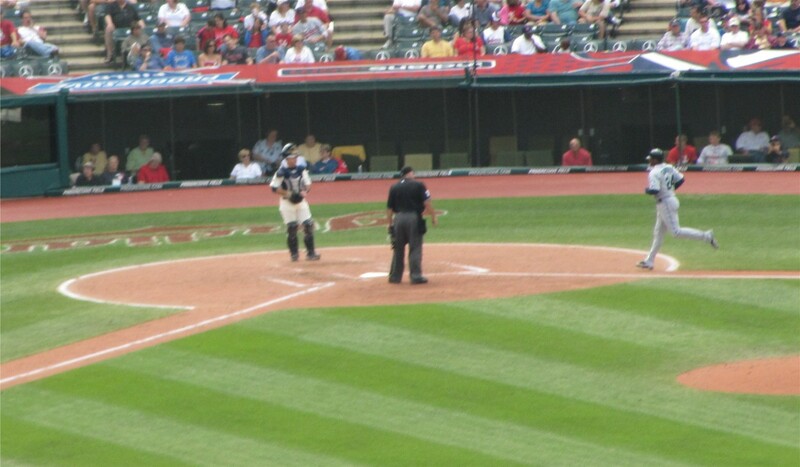 Then, in the bottom of the first, I got this picture just as Reds rookie Chris Dickerson hit his first career homerun. The ball landed in the Cardinals bullpen just below the glass partition to the left of the picture. I took this random shot of the LF seats and the scoreboard. The scoreboard seems sort of short, doesn’t it? Its really wide, but not very tall at all. 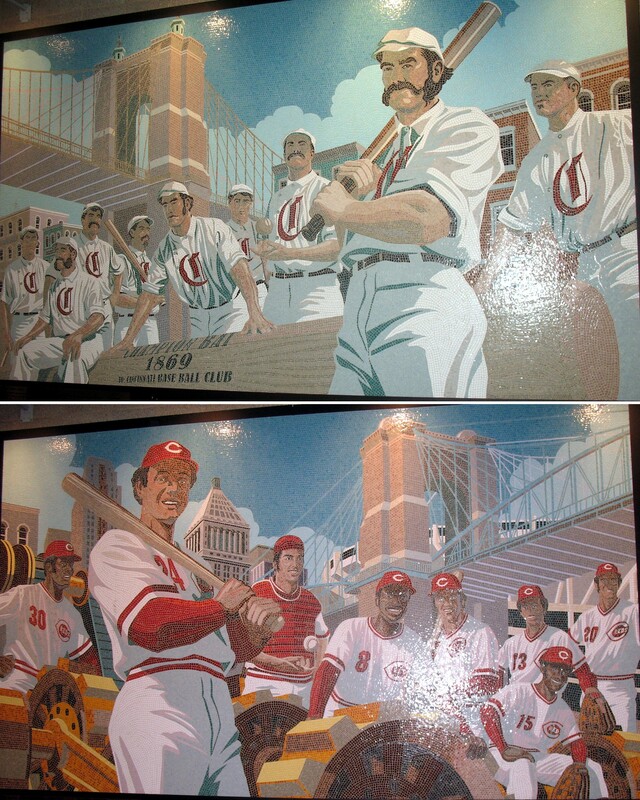 After we finished our ice cream, we headed back toward home plate because I saw some ballpark artwork I wanted to photograph while I had my hands full of ice cream helmets. Here they are, two big mosaics of the . Above is the 1869 Red Stockings, which according to Wikipedia were the first “openly professional” baseball team. Below, is the Big Red Machine from the 1970s…including short-time Mariner and father of a future Hall of Famer, Ken Griffey. Back to the game, in the top of the third, Pujols hit a ground rule double. The first of two doubles and three total hits on the evening. By the end of the third, a bulk of the scoring for the game was done. The Cardinals were winning 4-2. Each team would score only one more run. Late in the game, I ventured out in search of some pizza and took some more ballpark pictures. 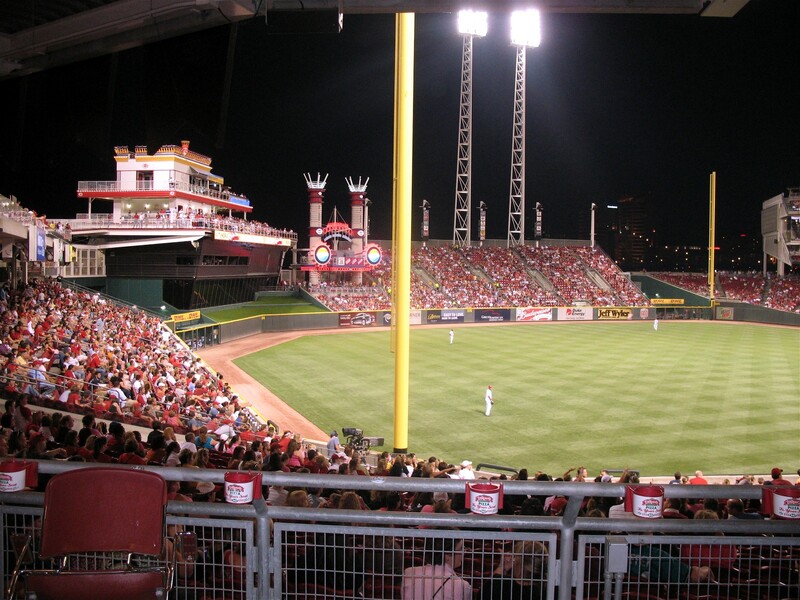 Here is Great American Ball Park from foul territory in the LF corner. Our seats are all the way across in the top corner of the RF bleachers. To the right, a view of the extra wide concourse in foul territory down the 3B line. 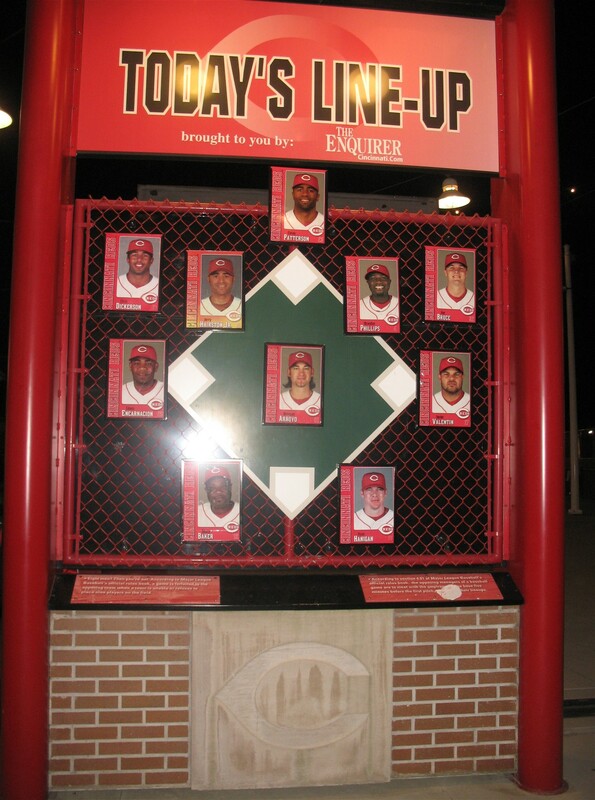 To the left, a picture of the Cardinals bullpen. Directly across the field I have circled in yellow the big open concourse pictured to the right. To the right, my dad in our seats up above the cardinals bullpen. To the left, I backed up a bit and got a shot showing a little more of the standing room area down the RF line. 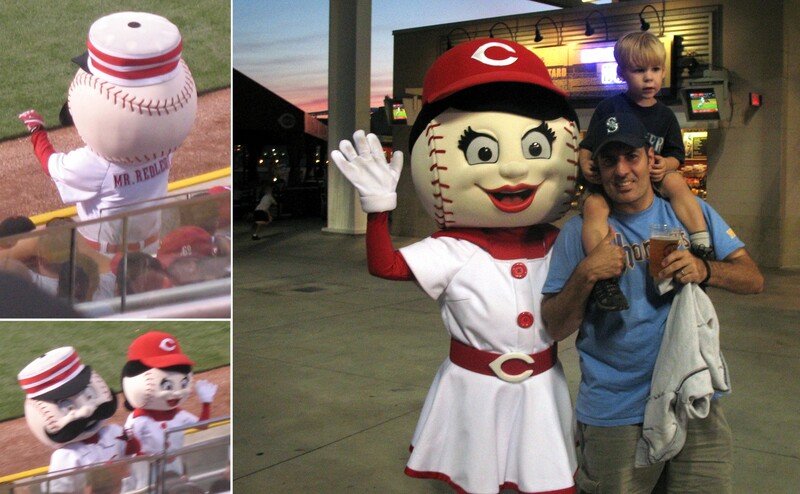 …I tried to also find Mr. Redlegs for a photo-op, but he was nowhere to be found. The pictures to him above to the left are from earlier in the game. With one out in the bottom of the ninth, the Cardinals brought in Chris Perez. He gave up one hit, but struck out two to secure the win for the Cards and the save for himself. 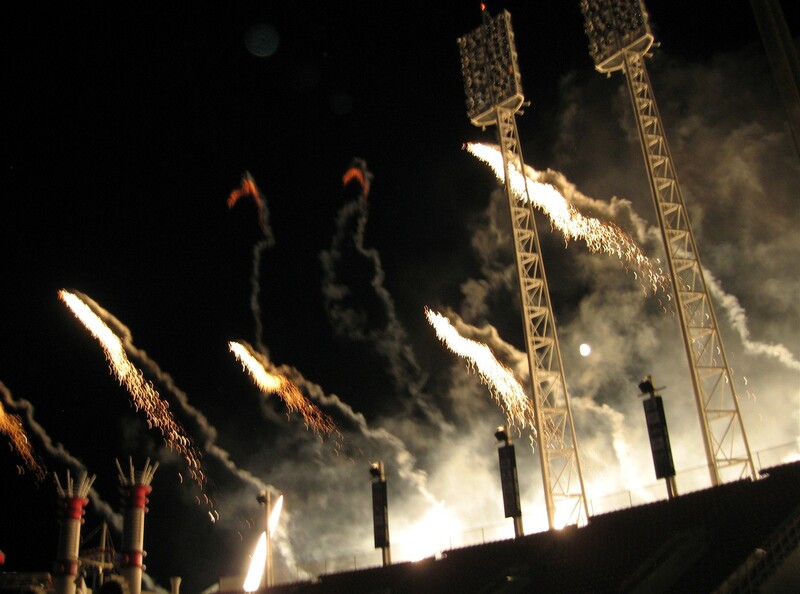 …it was an amazing firework show. And an outstanding first day of our first roadtrip. Tim would fall asleep on my shoulders as we walked back to our hotel. 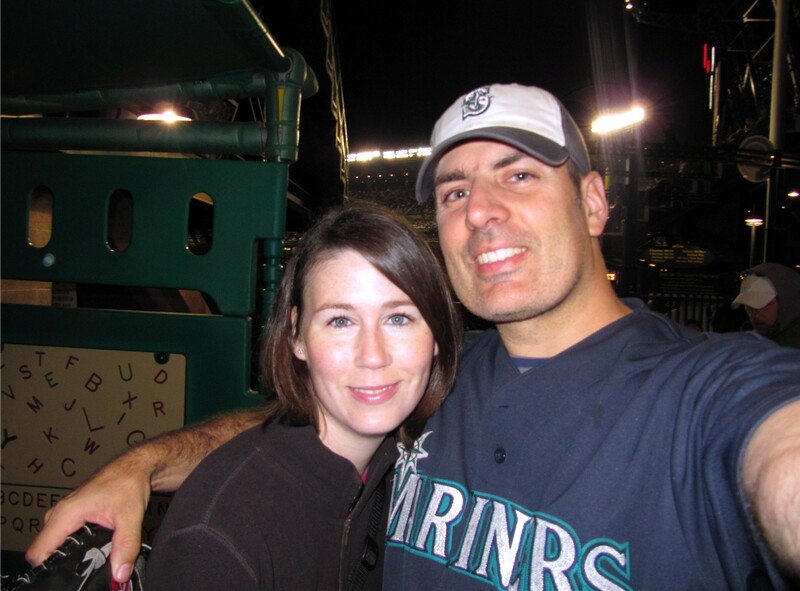 On September 3, 2007, we headed up to NYC to take in a Mariners game in the Bronx. We went with my friend Marc from college. Marc is also from Seattle, but in 2007 he was working in the investment world in NYC. This was the first time I’d seen him since college. 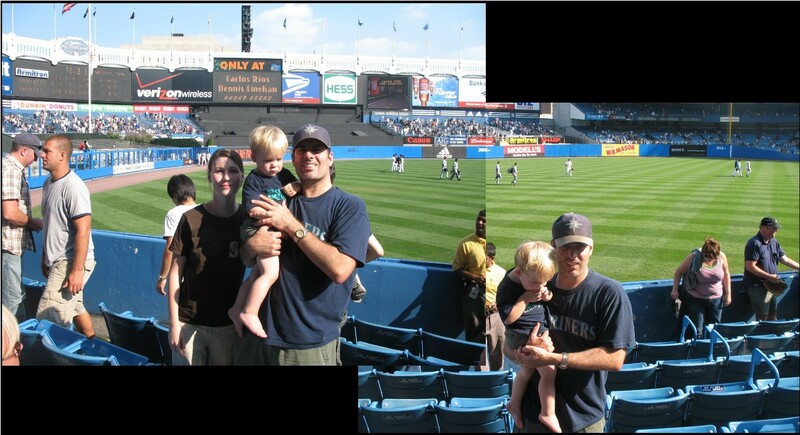 And, it was Tim’s first trip to NYC and to “The House That Ruth Built” (and Griffey destroyed). …where Tim REALLY enjoyed seeing lots of dinorsaur bones. Trust me. 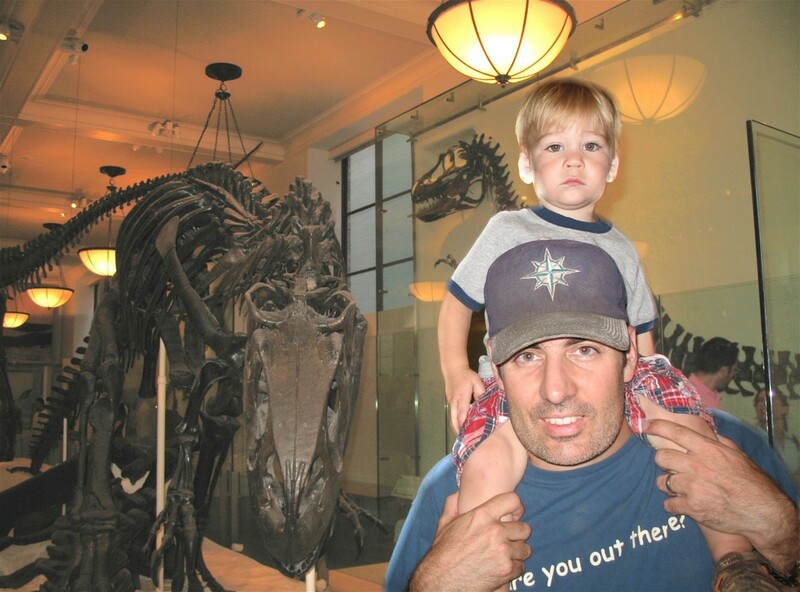 He looks utterly bored in this picture, but he really loved the museum. 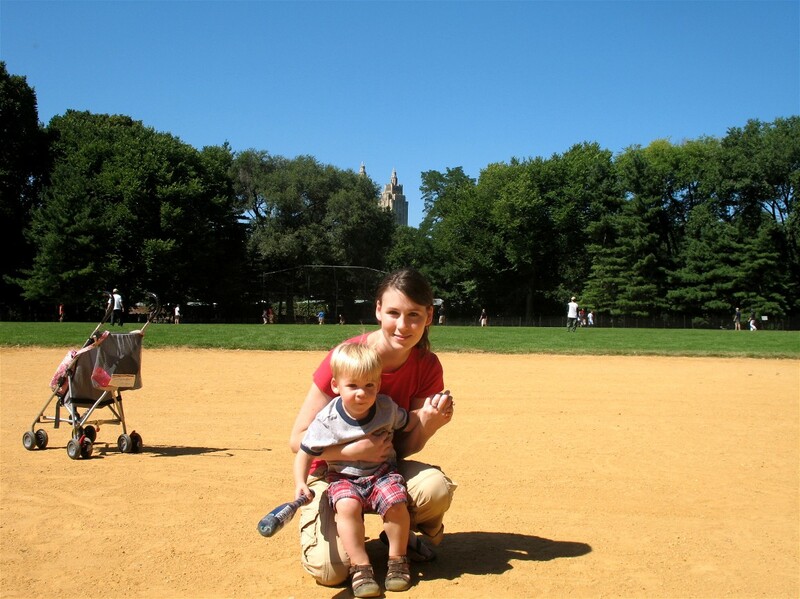 So, if you find yourself at 79th & Central Park West in Manhatten, check it out. There were thousands of people in the park and every other field was packed. Soon, it was time to meet up with Marc and his wife, Angie, and take the 4-train up to the Bronx. I assured Tim that there was nothing to worry about. The Mariners would surely destroy the home team. The Mariners would be throwing their young ace, King Felix Hernandez, while the home squad would be trotting out an old goat, a pre-Mitchell Report Roger Clemens. I was ready for a historic Clemens loss, and I would not be dissappointed. By the way, not everyone was a fan of the opposition, that is Marc shown behind Tim’s outreached arm. 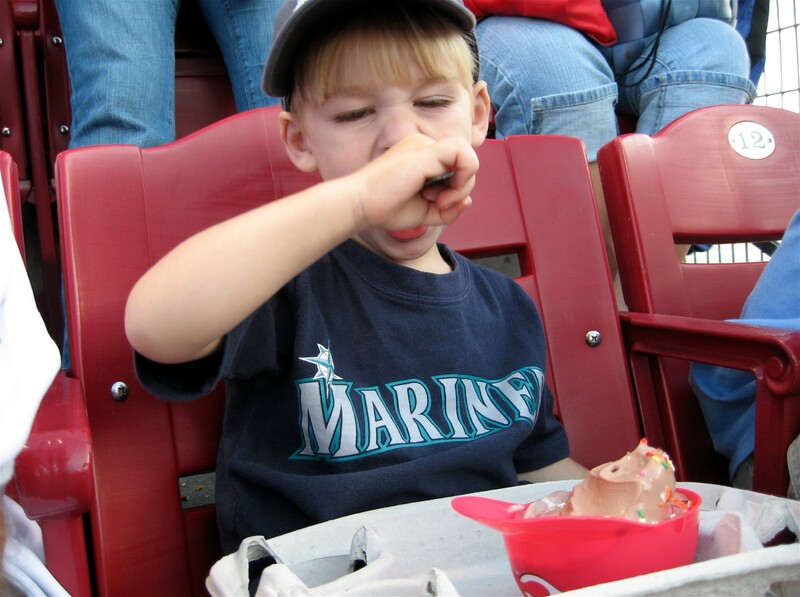 He’s a good Mariners fan. Now, I wouldn’t lead Tim astray, it WAS a great and historic game. In fact, despite the fact it didn’t feature former-and-future Mariners great Ken Griffey, Jr., this is one of the best games I’ve ever witnessed. The game started like so many Mariners games do: Ichiro hit a line drive single to right field. So things were already off to a good start. 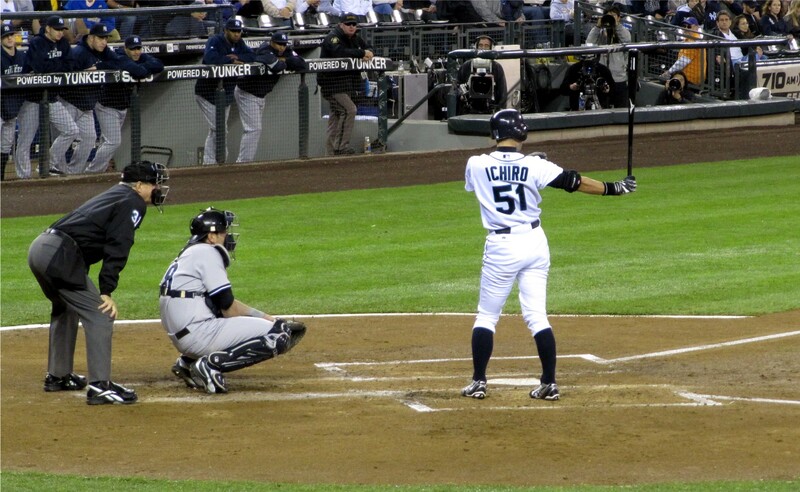 Ichiro extended his hit streak to five games in the five games Tim had attended to date. But that was all the M’s managed in the top of the first. The bottom of the first was the only bad part of the game. 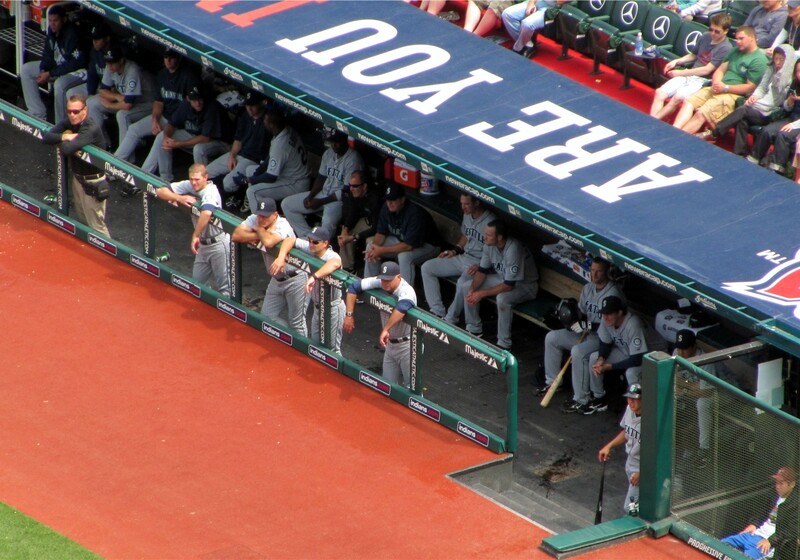 King Felix had some first inning jitters and fell behind by 1 run. But don’t worry, the M’s came back in the top of the second. Raul Ibanez started off the inning with a single to LCF. Ben Broussard walked. And then Clemens fired a wild pitch to the backstop sending Ibanez to 3B. Finally, Jose Lopez got an infield hit to score Rauuuuuuuuul! And just like that the Mariners had tied it up 1-1. By the way, check out the old water-soaked wood on the bottom of the upper deck (behind/above us). You don’t see that in a modern stadium! Well, really, I think you don’t see that anywhere — not in Boston or on the north side of Chicago, which were much older than this 1970’s re-model job. The top of the second was just the Mariners warm-up act. They were about to lower the boom on their hosts. 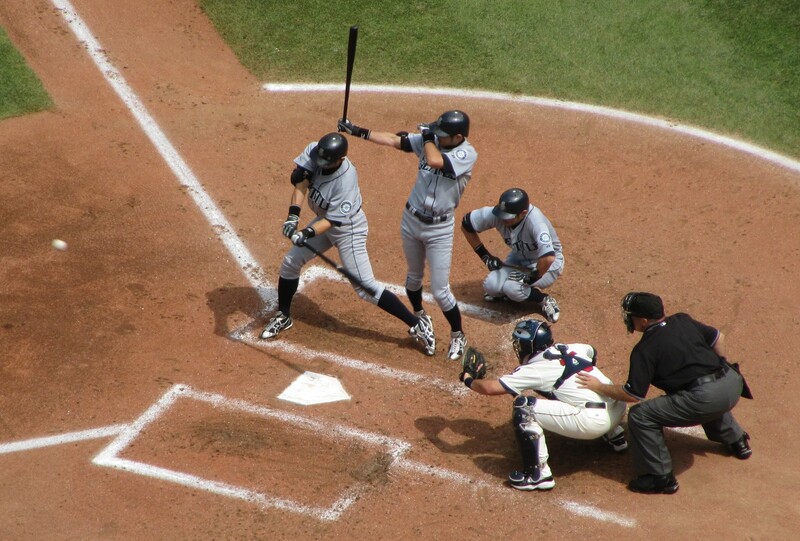 Ichiro led off the top of the third inning with a homerun blast to LCF. Not only did the hit give the Mariners the lead (for good), but it was Ichiro’s 200th hit of the season for the SEVENTH season in a row! 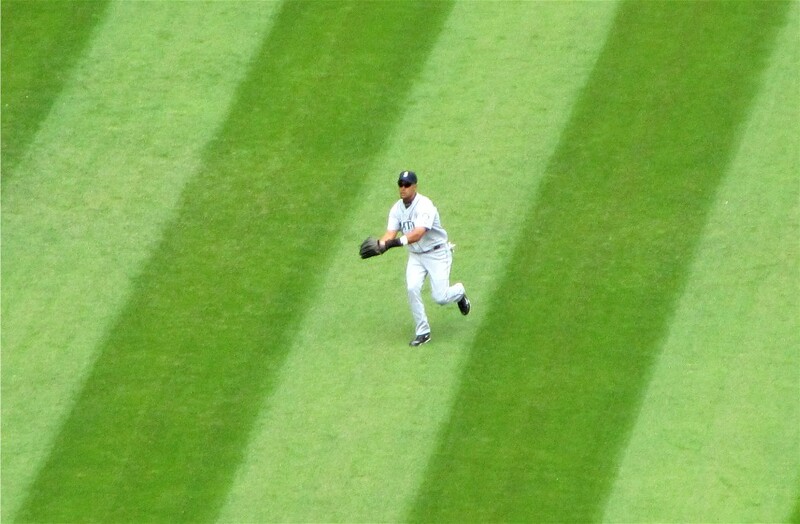 Hooray for Ichiro!!! And hooray for us for being there to witness this piece of history. 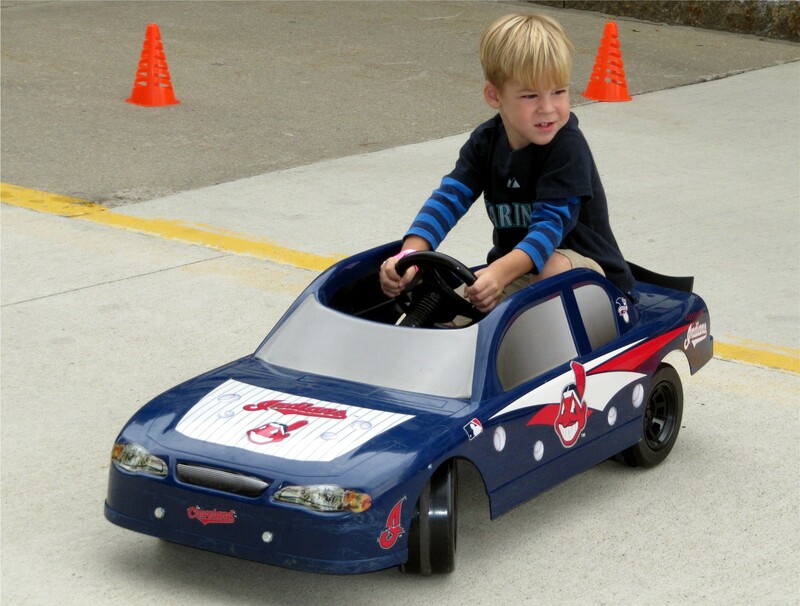 Meanwhile, King Felix kept mowing down opposing batters. In the top of the fourth, the Mariners scored three more runs on a single by Adrian Beltre, hit-by-pitch for Jose Lopez, a double by Yuniesky Betancourt, and another single by Ichiro. At some piont in the 4th inning, Roger Clemens hurt his leg falling off the mound awkwardly. In an unprecedented move, Joe Torre brought former Orioles great Mike Mussina into the game in relief. A quick review of Moose’s bio will reveal that this was the ONLY relief appearance of his probably-Hall of Fame career — 537 games, 536 games started. Anyway, as of September 3, 2007, Roger Clemens had 354 wins (and he would NEVER win again), Mike Mussina had 247 wins, Britton had zero career wins (he is still stuck on zero), and Farnsworth had 27 career wins. 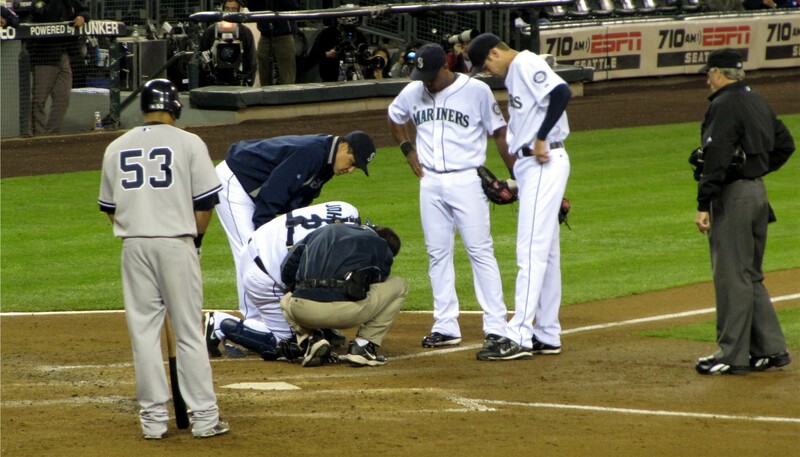 All totaled, the Mariners faced off against SIX HUNDRED TWENTY-EIGHT (628) career wins. What do you think, is that a record? I’ve certainly never heard of a team throwing more career wins in one game. Well, actually…in the three games Tim has seen the Yankees play in his life, the Yankees haven’t been very bossy. We’ve seen the Mariners beat the Yankees twice and the Orioles just a couple weeks ago beat the Yanks too. So, really, the Yankees have been pretty accomodating in the games we’ve seen them play. We were hoping they would be similarly accomodating at this game. We had four excellent seats in section 151 (left field). 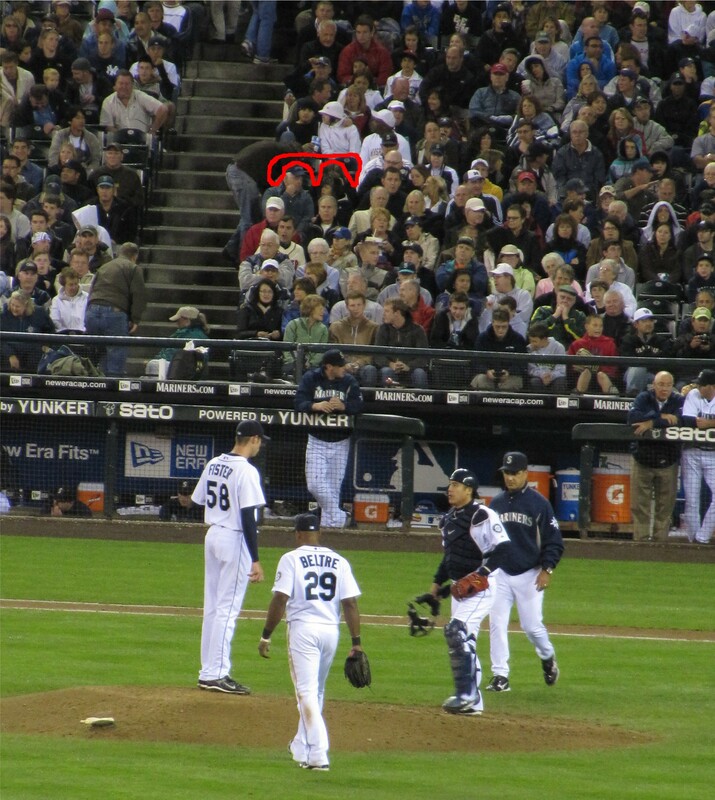 But, I also had my best buddy Paul’s two tickets in section 123 (just a couple rows back from the Mariners’ dugout). Paul was at a family get-together and was hoping to meet up with us later in the game. He never made it. …he would draw a walk. This is his, “I know you’re looking at my ice cream, don’t even think about, I’m not sharing” look. And, true to his look, he did not share. Two more notes about that picture. First, I don’t like it when teams leave a big huge bar code on the side of the ice cream helmets. We haven’t received many bar-coded helmets. Mostly in Philadelphia. 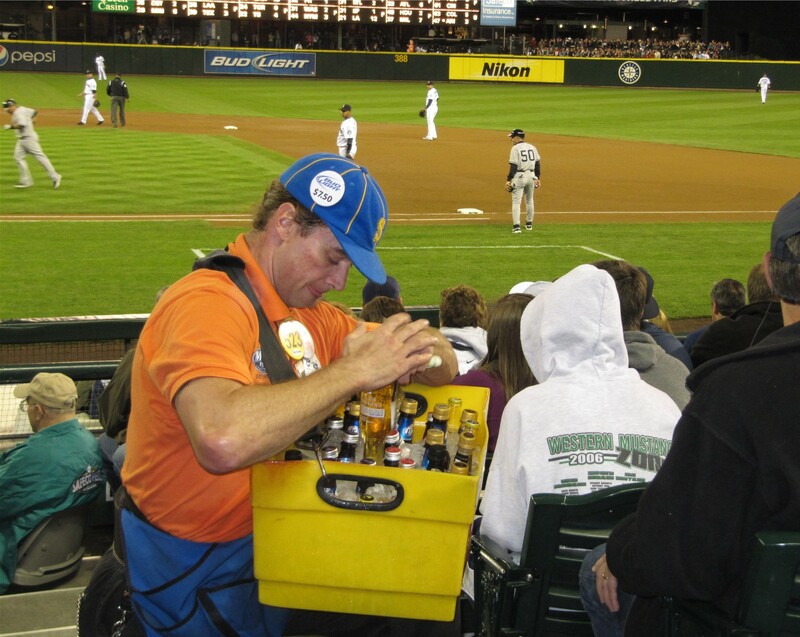 Before this week, we’d never received a bar-coded helmet at Safeco Field. And I hope we never do again. Second, that guy in the white hat sitting behind Tim was pretty hilarious. He and this buddies were all decked out in Washington Husky gear. Just a couple hours prior, the Huskies had taken down my dad’s alma mater, the No. 3 ranked USC Trojans. (FYI, in college football, I root for my Temple Owls (GO OWLS!) and then the entire Pac-10. In conference play, I root for the UW, followed by WSU (my brother’s alma mater), followed by USC (dad), followed by whichever team is located closest to Seattle. But in the grand scheme of things, the Mariners are the only team I truly care about in any sport). Anyway, as I was saying, that guy was pretty funny. 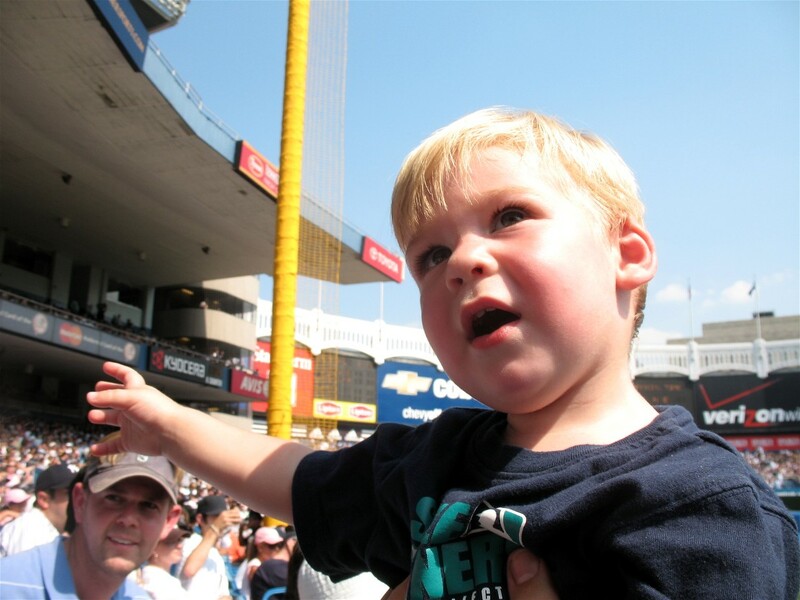 He kept yelling at all of the Yankees (particularly C.C. Sabbathia) and saying he was going to buy them dinner at various fast food restaurants if they continued to strike out (Yankees batters) or give up hits (Sabbathia). He was going to take them to McDonald’s, Burger King, Taco Time, Papa Murphy’s, Red Lobster, etc., etc. 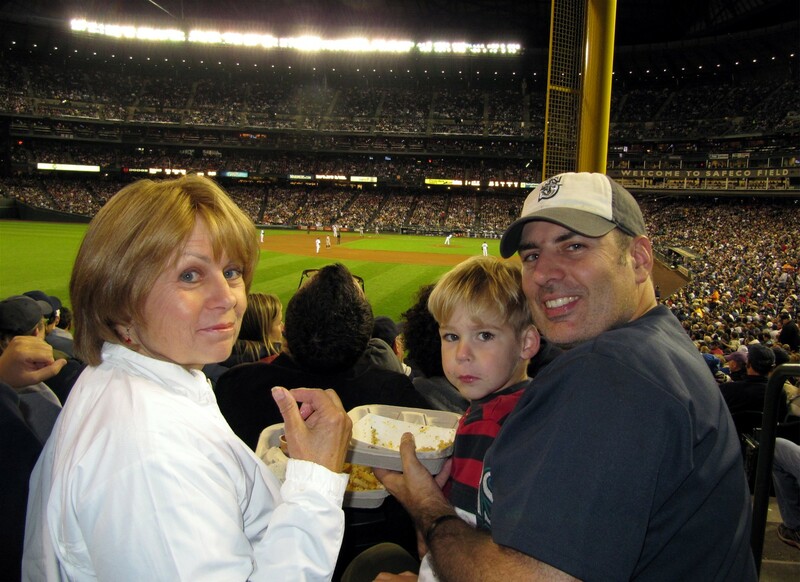 Paul’s family has split season tickets with another guy (Louie) who has had the tickets since 1977 (the M’s first season, and the year Paul was born). In the Kingdome, Paul’s seats were even closer (third row, I believe) but they crammed a few extra super-expensive rows in front of his seats at Safeco Field. The tickets are row 14, but I think they are only about 5-8 rows back from the dugout. I like Jose. He’s good. 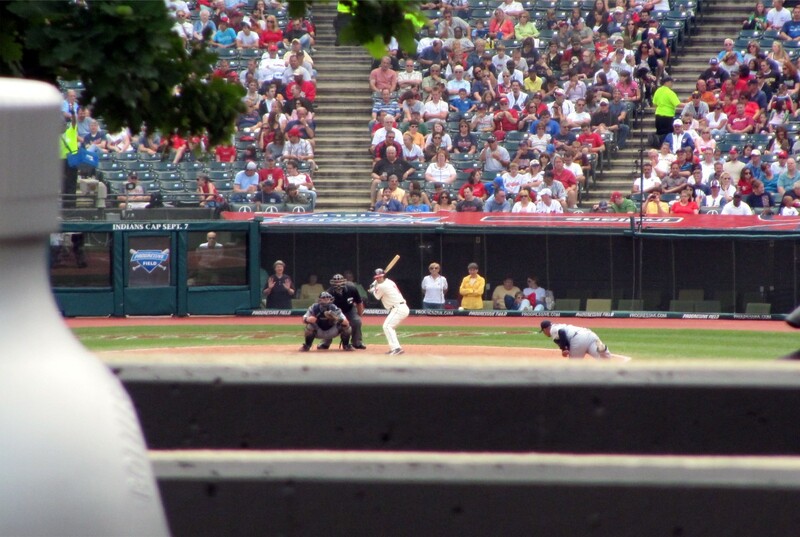 …he hit a double on this pitch, but my swinging shot and rounding first shot are both horribly blurry. His actual poems are moderately better than that, but you got the gist of it. …but unforunately he was shooting blanks on this night. …it was an odd play, and Kenji was down for a few minutes. 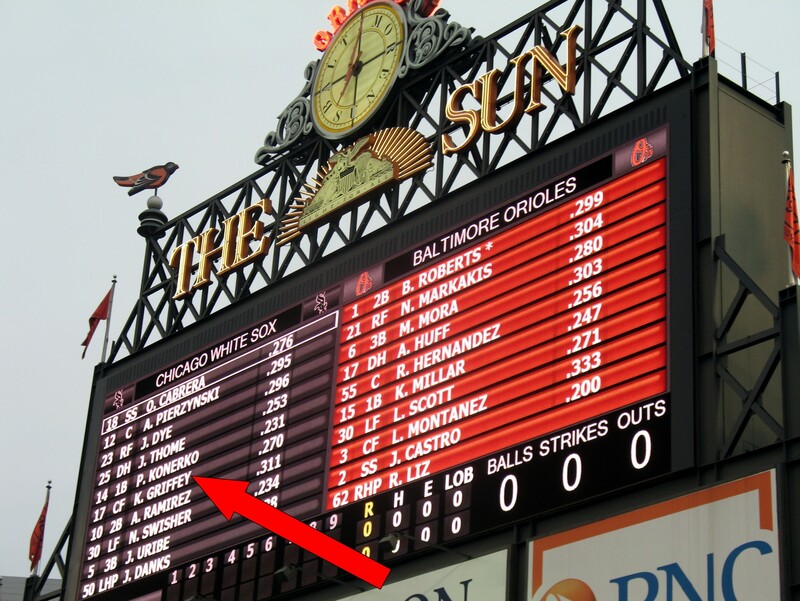 Row 34 is only about 5 rows back from the LF wall, directly down the line behind the hand-operated scoreboard. That is Tim’s official “garlic is too spicy” face. As for me, I’m a huge fan of garlic. And these fries we ridiculously (in a good way) garlicy. This wasn’t garlic powder or garlic flavoring. This was full on mashed up and diced garlic bits. I think each of our orders of fries had about 5 entire garlic bulbs on ’em. When all of the fries were gone, there was still an entire hand full of diced up garlic bits in each little cardboard tray. I tried to eat all of the garlic in one of the trays, but I failed. It would have made my head explode. Too spicy. See the red outline in that picture? Those are Paul’s seats as some non-ticketed dude prepares to take advantage of Paul’s absence. That’s Paul in the middle, to the right is Paul’s brother Kevin, and to the left? Well, that’s none other than future Hall of Famer, Ken Griffey, Jr. 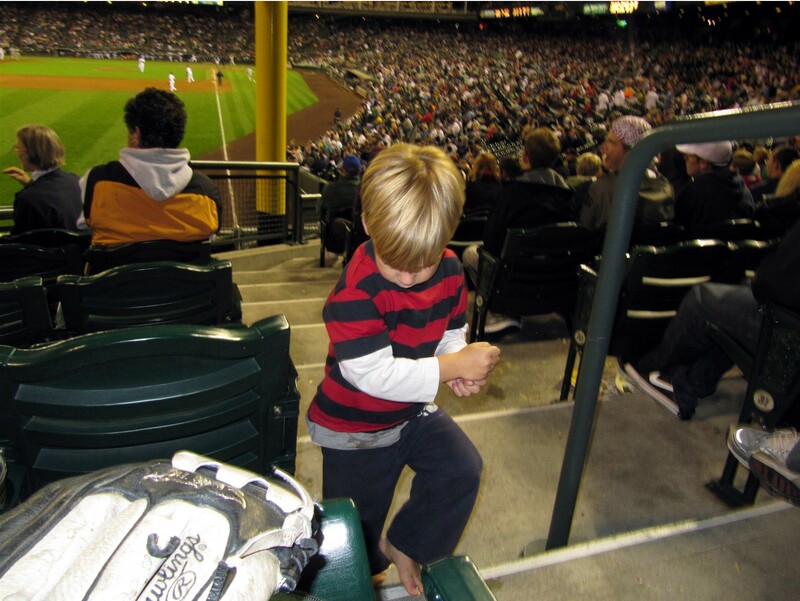 He would stand on the stairs in row 35 and cast his fake fishing line down toward the OF wall. Late in the game we ran around in the OF concourse a bit. And that is where we were when the Yankees recorded the 27th out in the bottom of the ninth. 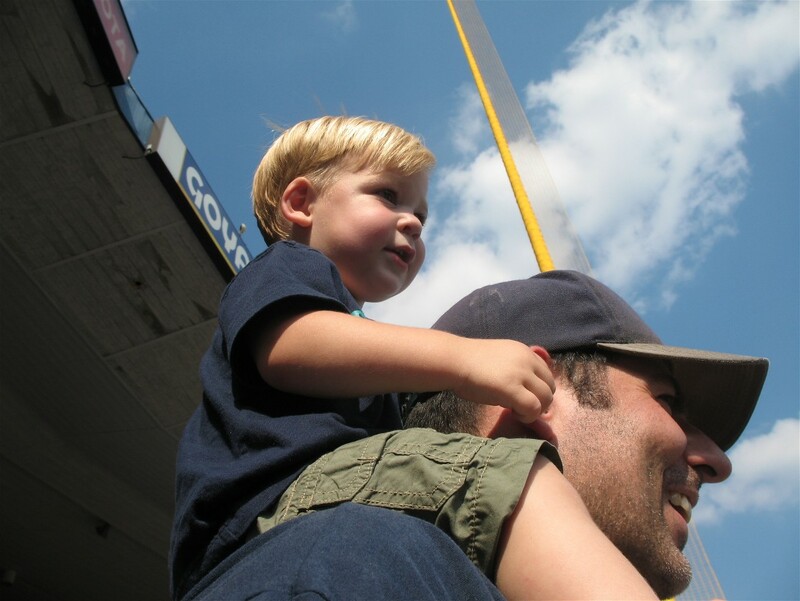 Aye, aye, aye…I was hoping Tim would never have to see the Yankees win a game in his life. Oh, well, I need to come to grips with the fact that I can’t protect him for every bad thing that might happen in life. We have one more Mariners game this season. And with a win, the Mariners will finish the season with a winning record at games attended by me and Tim. Let’s do it M’s!!! One more comment on the Yankees. This is the first time I’ve seen the Yankees play a game outside of Yankee Stadium since August 24, 1995. I attended that game with Paul. That game is widely recognized as the turning point in the Mariners season, after which they made a hard charge past the California Angels of Anaheim. The Mariners were 11.5 games back at the time. And in the 8th inning, the Mariners were losing 7-5. In the 8th, Edgar Martinez hit a home run off of David Cone to make it 7-6 Yankees. But the Mariners had been perenial losers. The first two batters made quick outs in the bottom of the ninth. Paul and I started to give up on the game. In fact, we decided to leave and try to beat traffic. But as we were walking out, Vince Coleman drew a walk from John Wetteland (now Mariners bullpen coach). Paul and I started thinking about things. Junior could get another at-bat! We sprinted back to Paul’s seats (you know, the one’s I mentioned above, the ones 3 rows behind the 1B dugout). As Joey Cora, battled Wetteland, Coleman stole 2B and 3B. Cora then lined a single to LF to score Coleman and tie the game. Up to the the plate sauntered Ken Griffey, Jr. He would see only one pitch. 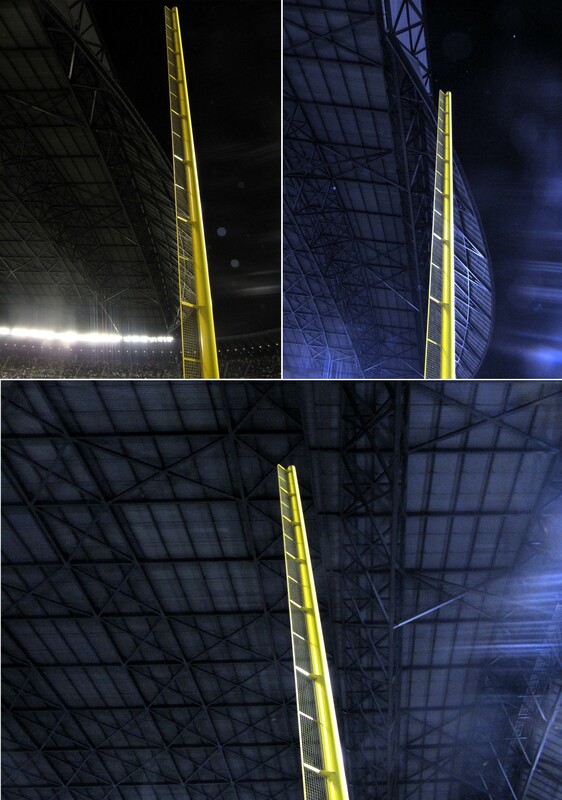 And we would see that pitch land in the upper deck in RF. MARINERS WIN!!! Twenty-five days later, the Mariners had erased the Angels’ 11.5 game lead. 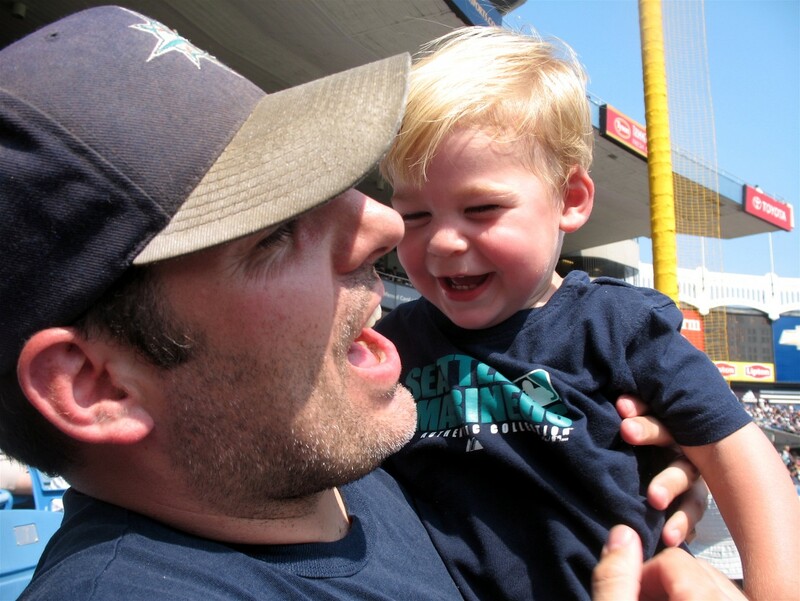 Ultimately, the Mariners would beat the Angels in a one game playoff to claim their first ever A.L. West title. So you ask what is the point of that long story? 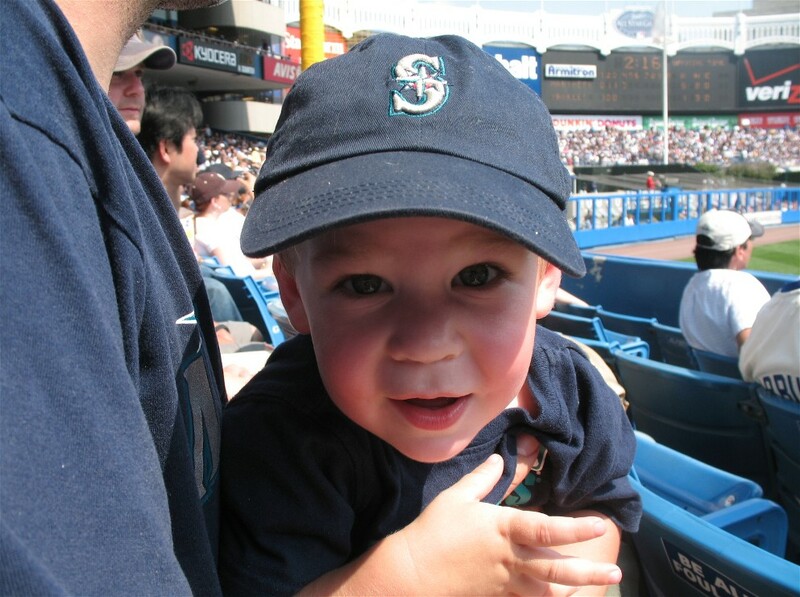 Well, back in 1995, we watched the Mariners beat the Yankees in Seattle free of the presence of hordes of Yankees fans. You see, the Yankees hadn’t been very good for a while. They had not made the post-season since 1981. And they didn’t have the massive traveling fan base that now accompanies them everywhere they go (and the hordes of bandwagon *fans*). At least they didn’t have them in Seattle. It was a much more pleasant way to watch a home Mariners game. I live on the east coast and I see the Mariners on the road more than I see them at home. So, I like my Mariners home games to feel like Mariners home games. 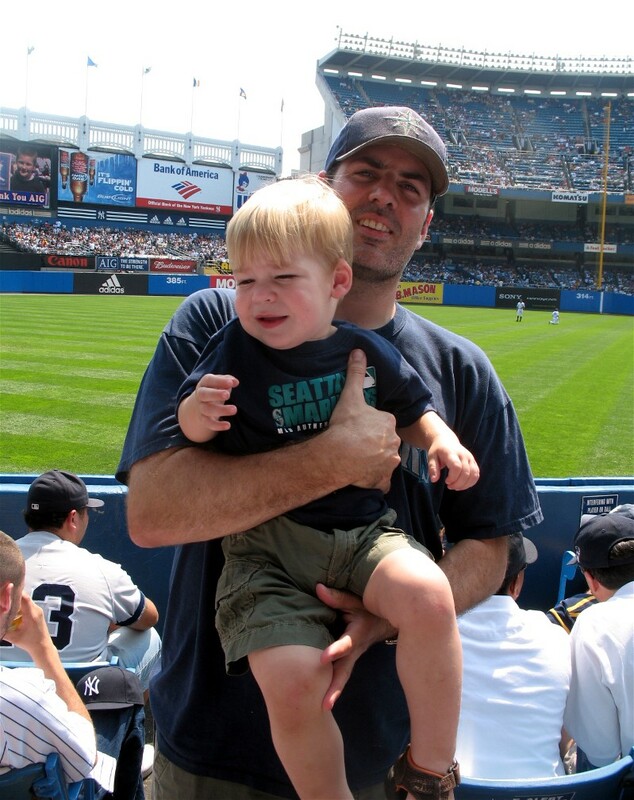 All this is to say that, this is likely my last Yankees game in Seattle. 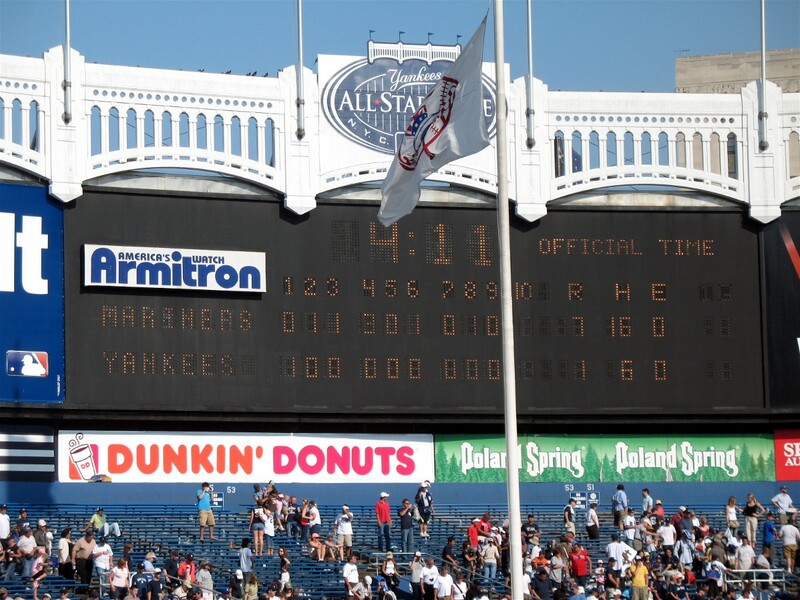 By the way, don’t fear, the next day the Mariners would crush the Yankees to take the series 2-1. Griffey would hit a bomb. Qwest Field sits on hallowed grounds — the site of the Kingdome. I really wish Safeco Field could have been placed on the Kingdome’s site. But it couldn’t happen. 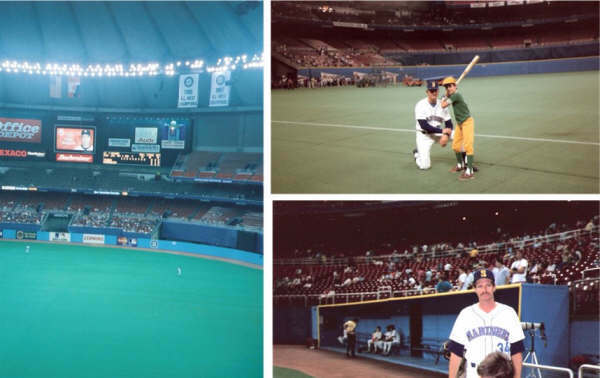 The Mariners needed to play in the Kingdome until Safeco Field was ready to open in July 1999. 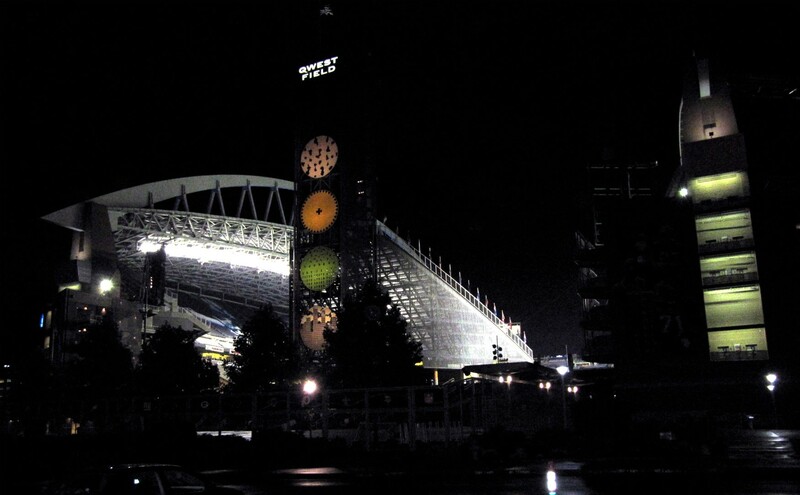 The Seahawks on the other hand, got an upgrade, they played at Husky Stadium while Qwest Field was being built. Husky Stadium is probably better than Qwest Field. One final note, the day after this game, we flew back into Philadelphia. As we were driving out of the Philadelphia airport, Tim again told me that the Yankees are “bossy,” and he added that they “cheat.” I told him that was not very nice of the Yankees. But then, he told me that the Yankees called him on the telephone and apologized. So, I guess that was considerate of the Yankees. Only once before have I broken the normal protocol and started an entry at the middle of a game, rather than at the beginning. It was for our third game at Fenway back in July, and the purpose was to explain Ken Griffey Jr.’s fourth inning single off of the Green Monster. At the time, it was the first and only hit Tim had ever seen Griffey collect. It was a truly special moment. You can read all about it here. Once again, I am happy to brake with tradition. Once again, I will start my story with zero outs in the top of the fourth inning. Once again, the story will involve my favorite player of all time, Mr. Ken Griffey, Jr. Guess what, when we arrived at The Jake and checked the Mariners line-up, Griff was in there – scheduled to hit clean-up and DH. That’s a good start. 8) Have fun and make memories. At the beginning of the day, with 26 games under our collective belt on the season, Tim and I had covered most of the goals: “All 30 Teams” – check; Baseball Roadtrip – check; 10+ stadiums (including HHH Metrodome, Nationals Park, New Yankee Stadium and Citi Field) – check; Continue 9/12 Baseball Anniversary tradition – check (we’ll be at Yankee Stadium on 9/12/09 for the third anniversary of Tim’s first game); and Have Fun and Make Memories – check. Due to a chain of events including a miscommunication, a late invite to the Outer Banks and a Citizens Bank Park sell out, goals 6-7 had to be re-scheduled a couple times and, ultimately, suspended until next season. But goal number one was left incomplete. In what might have otherwise gone down as a perfect season of baseball fandom, the most important task was left undone. The mere possibility of it was the entire reason for this trip. 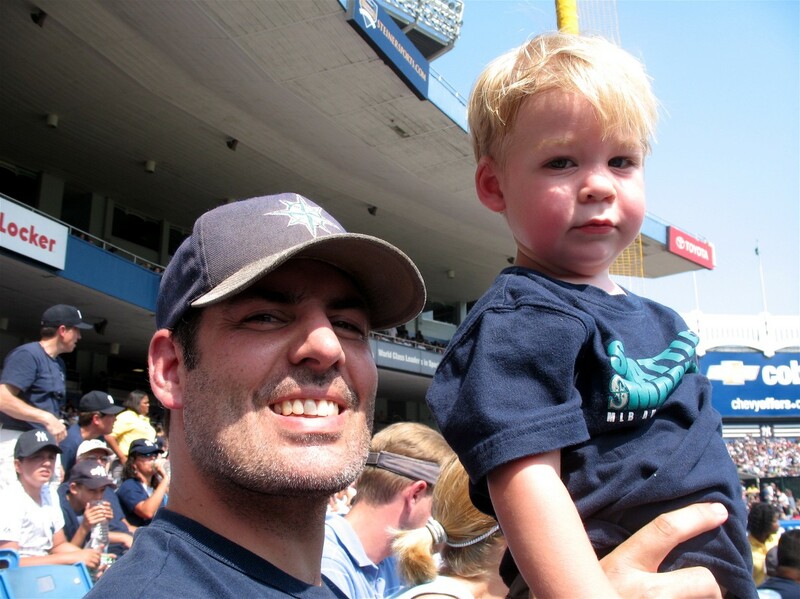 To see my boyhood (and, heck, my adulthood) baseball hero blast a homerun and share the moment with my son was all I wanted out of this season. …the guy cirlced on the right is the lucky guy who took home No. 624 on Griff’s career. And there you have it: our number one goal of the season completed! 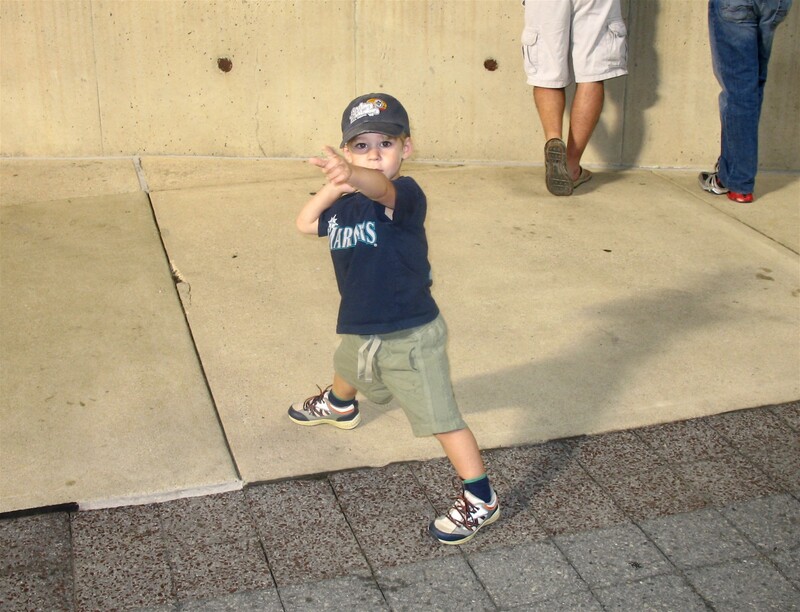 Never did I imagine 20 years ago, as an eighth grader going to games with my folks and marvelling at Griffey hitting homeruns in the Kingdome, that some day I would be in Cleveland, Ohio and witness the Greatest Mariner of All-Time hit a home run for the M’s while spending an afternoon at the ball park with my son. It was truly incredible. And, as my mom said to my dad while watching the game on TV some 2,500+ miles away, “that home run just made Todd’s whole trip.” It did. In fact, it made my whole season. Now…I hope to get a chance to do it again!! After Tim drove this car, Colleen and Tim played around some more while I went into the Jake and watched the last few minutes of Mariners BP. I hadn’t gotten much in terms of stadium pictures the day before, so I needed to tour around a bit. …the guy standing at the end of the red aisle is the guy who booted me out of the aisle. Two seconds later, Colleen called me and I headed back over to LF and met up with her and Tim. We had excellent seats in the second deck just above the Mariners bullpen. So we headed over there to check things out. After playing catch in the OF, Felix went into the bullpen and pitched off of the mound to M’s back-up catcher Rob Johnson. (I’ll still call Kenji Johjima our starter). 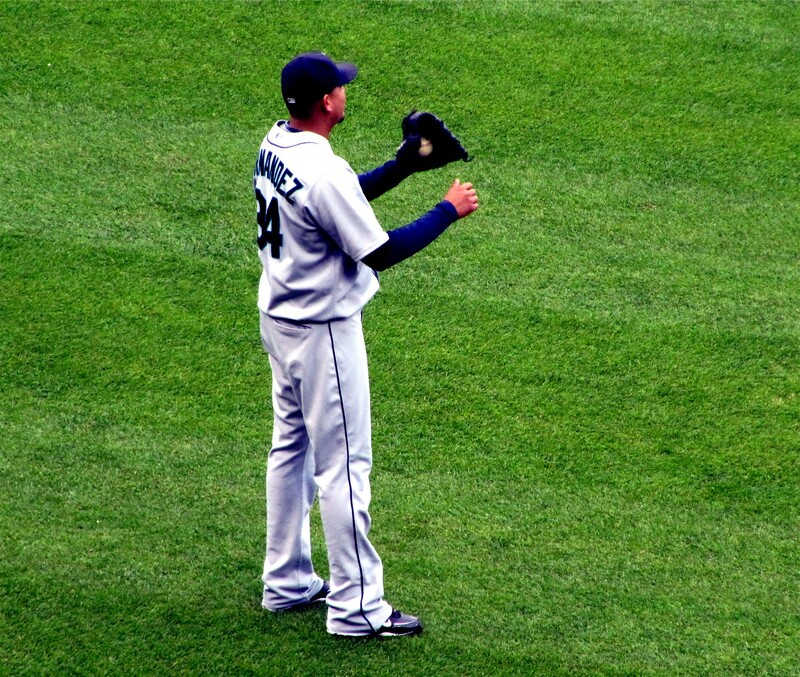 It was pretty funny watching Felix warm up. We actually couldn’t see Felix because the mounds are under the second deck. 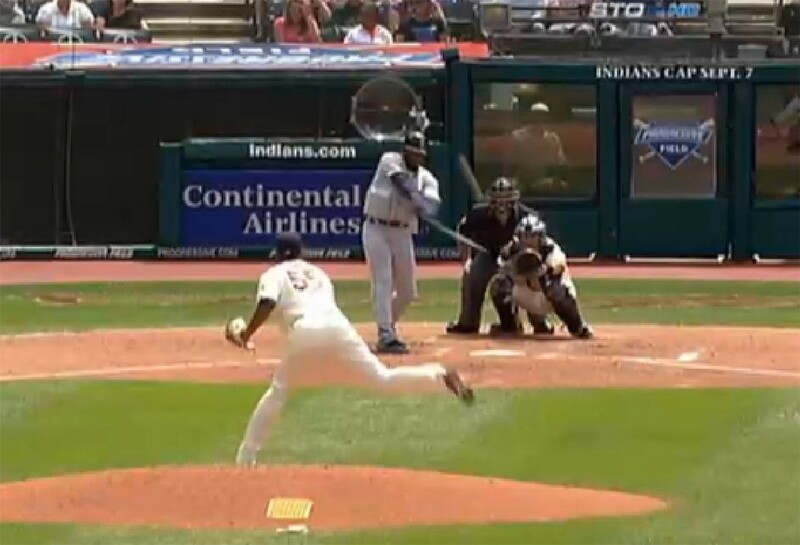 So we could just see the ball fly into view and into Johnson’s glove. I asked him why he called him sneakers. “He’s wearing sneakers.” Of course! Above to the right is the aftermath of a hilarious scene that I missed photographing. (I was wearing a new pair of shorts and I could never seem to get my camera out of the cargo pockets in time!). 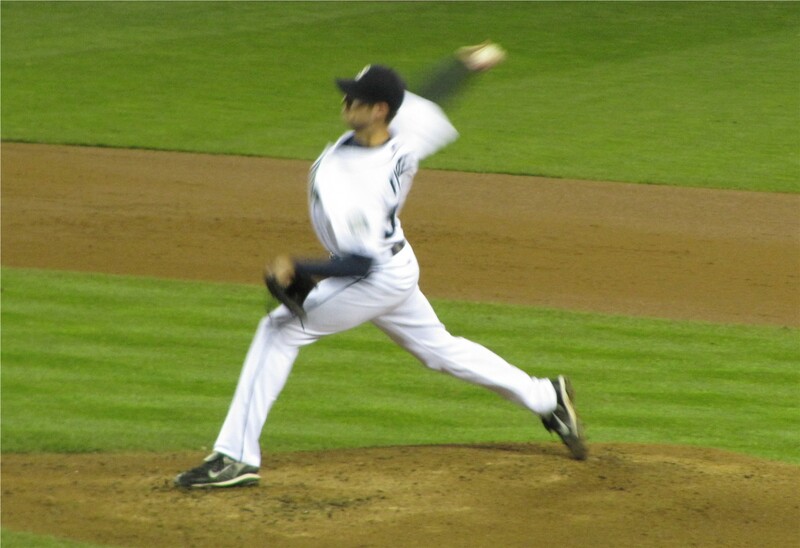 Mariners closer David Aardsma is standing at the bottom. Two seconds before this shot, he just finished going down that line of relievers having each of them smell the inside of his hat. Each reliever buried his face in Aardsma’s cap and then they would chat about how it smelled. It was pretty hilarious — much more hilarious than this picture of the aftermath of smellfest. This is interesting. Exactly like the bullpens at Nationals Part, the bullpen in the RF corner (to the right) is field turf, but the bullpen in CF (to the left) is real grass. Odd, huh? In D.C., I thought it was because there was an entrance from the employee-only (worker) level concourse where they could bring tractors, etc., through the bullpen to the field. I figured they put in turf so the heavy equipment passing through the bullpen wouldn’t get damaged. But I didn’t notice a similar tractor entrance in Cleveland. 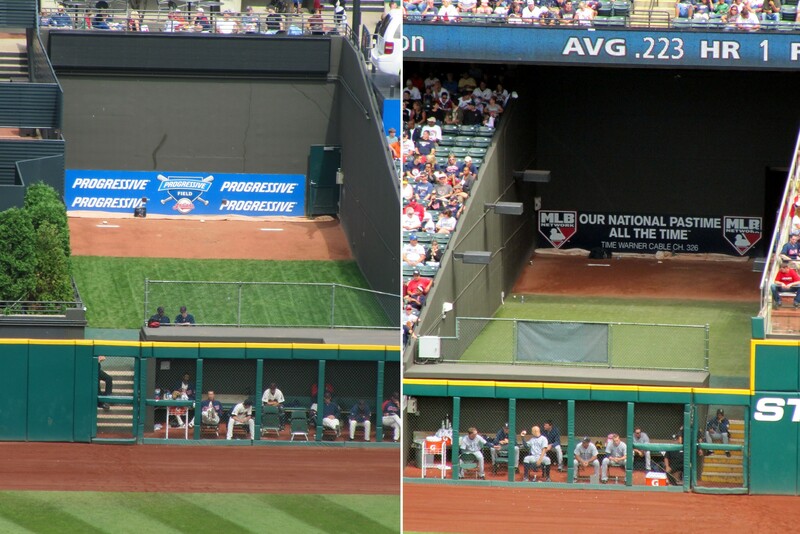 I’m not sure why one bullpen is grass and the other is turf. 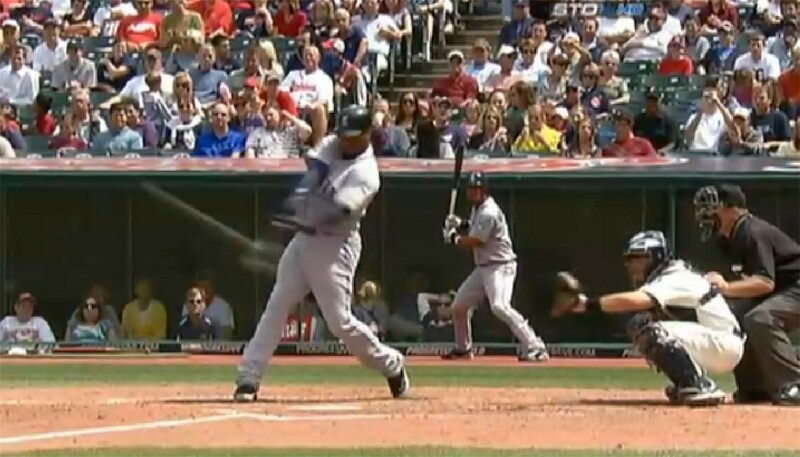 That swing resulted in a single up the middle for Ichi’s 184th hit of the season. After the tour, I met up with Colleen and Tim. Tim still didn’t want to leave the play area. 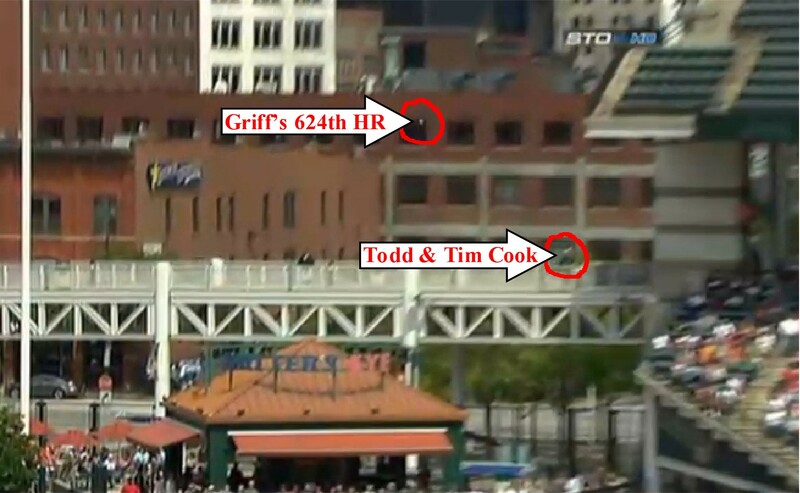 But we got him out of there in time to witness Griff’s bomb, as described above. 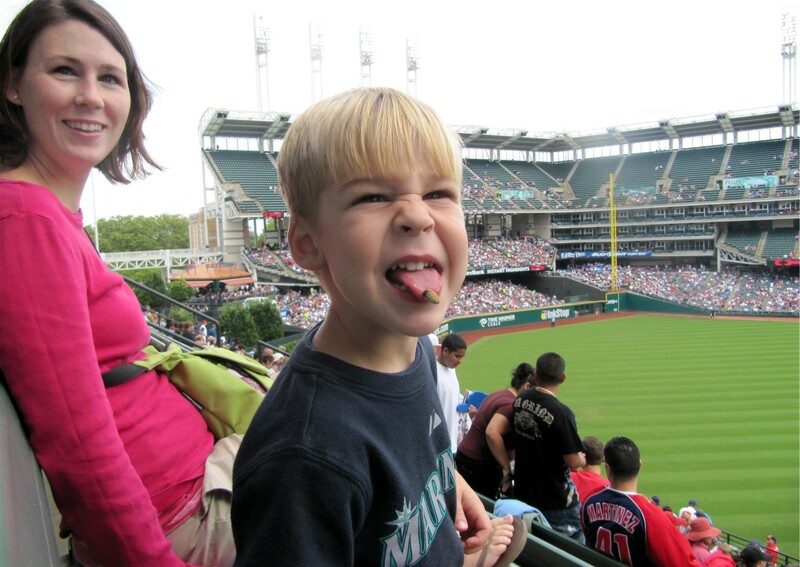 So, remember I mentioned Colleen was in line for pizza when Griff hit his home run? Well, she wasn’t able to get any. She is a vegatarian and when she got to the front of the line, they had just given away the last slice of cheese pizza. All that was left was pepperoni. So she came back and met up with us again. 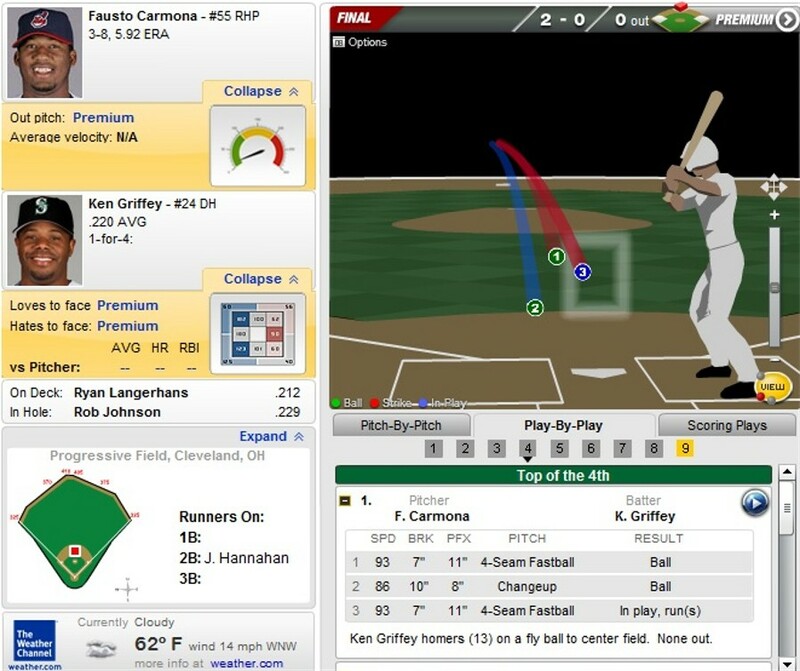 Unfortunately, the home run was Griff’s only hit on the day, so this at bat didn’t end well. After Tim got some pizza in him (yes, I eventually did make it through the pizza line), Tim forgot about the play area and we relocated to the LF bleachers so he wouldn’t see the playarea again. Unfortunately, it wasn’t the Mariners day. We wouldn’t push any more runs across the plate after Griff’s home run. Meanwhile, Felix had an off-day. The Mariners lost 6-1. 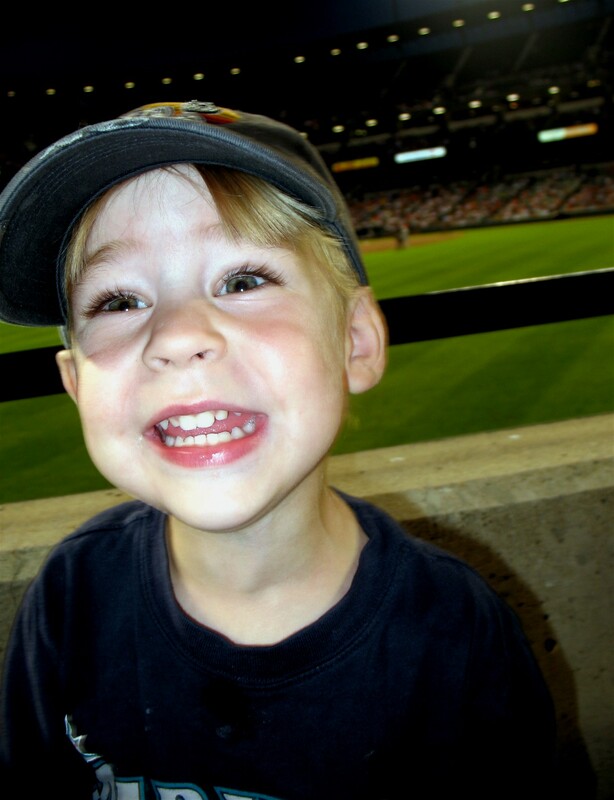 It was Kids Run The Bases day, but we had a six hour drive following the game, and Tim really needed a nap in the car so we headed out. Despite two terrible losses, it was great to see our Mariners once again this season, and it was OUTSTANDING to see Griff hit his 624th home run of his career. It’s the All-Star break…no Mariners games to watch. 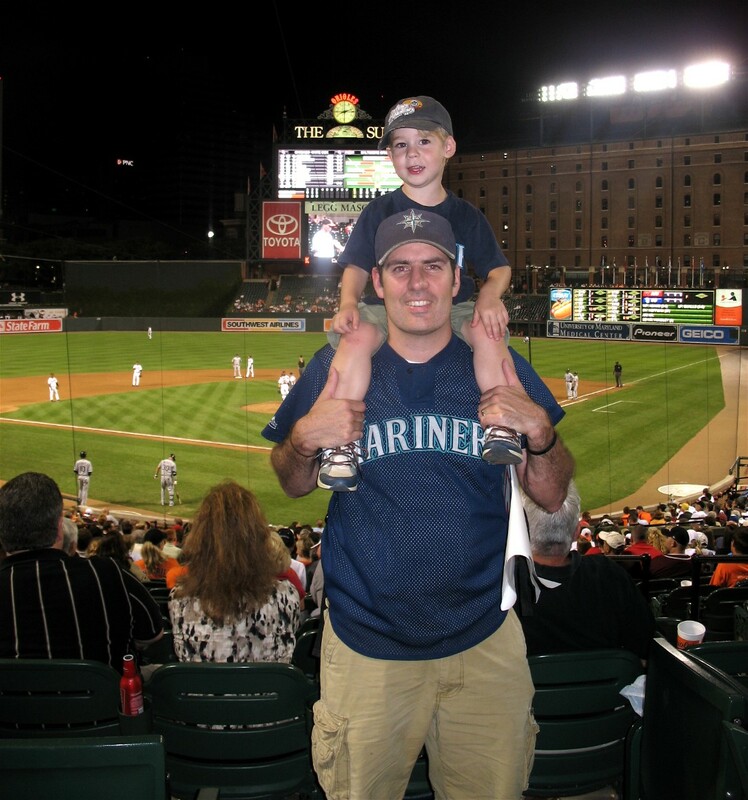 What better time to share a non-game-based Mariners story? Raise your hand if you know that Ken Griffey, Jr. has his own rap song? (Not just a rap song about him, but a song in which HE IS THE RAPPER – or one of them, at least). 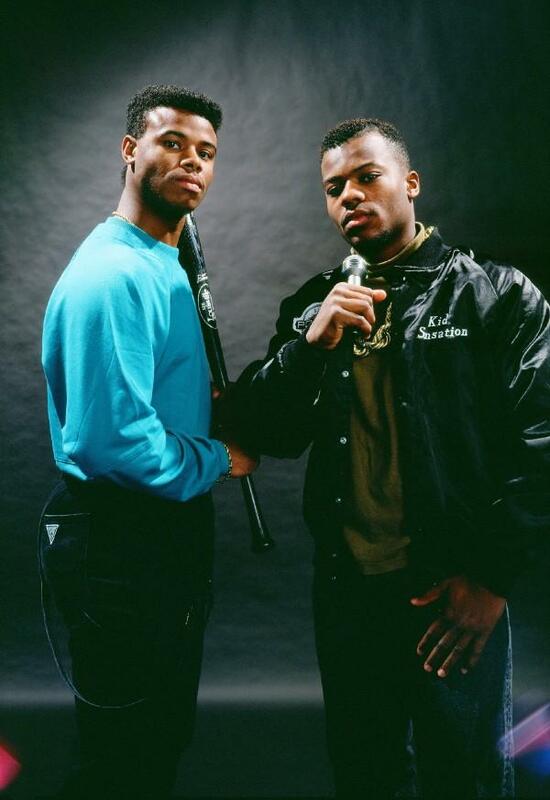 This is my story about Ken Griffey, Jr. , the recording artist, and his buddy, Kid Sensation. I loved the Kingdome. 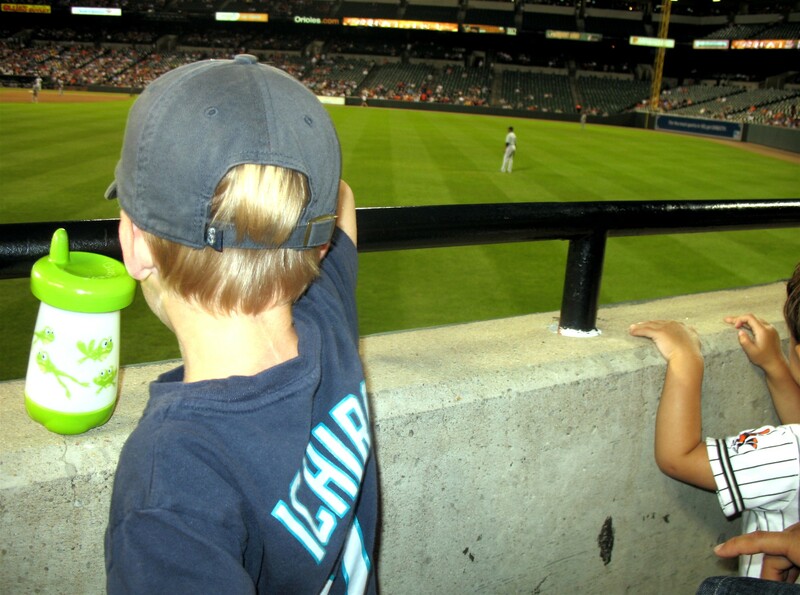 Safeco Field is outstanding, but the Kingdome will always feel like my baseball home. 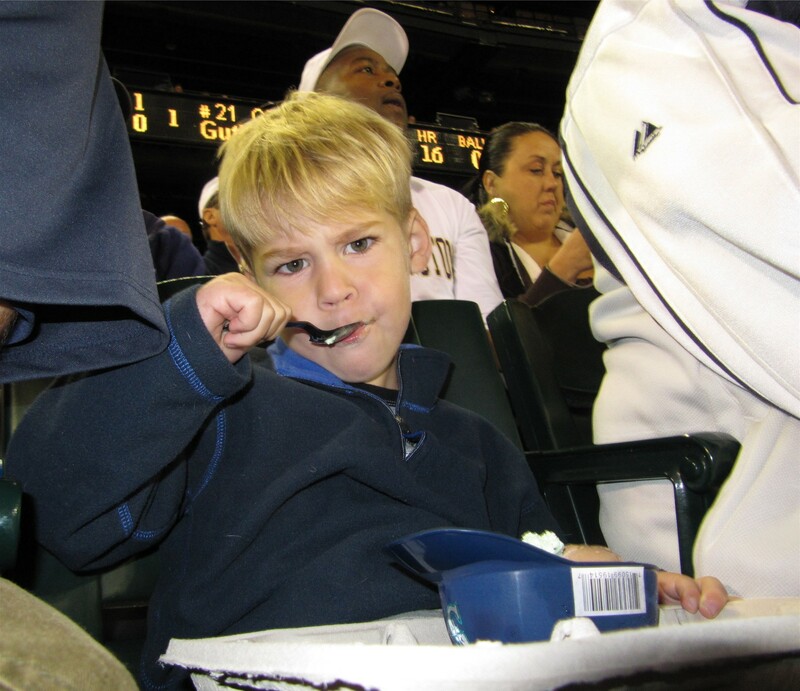 When they imploded the Dome in 2000, I calculated that I had spent 78 entire days of my life at the Kingdome – 97% or more of that time was at Mariners games. 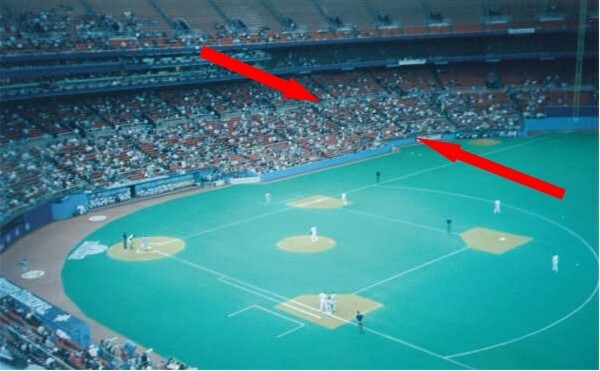 One thing I loved about the Kingdome was it was sparsely populated. Often times 15,000-20,000 people were crammed into 55,000 seats. There was a ton of room to move around and get to know the place. And I did. I knew the place backwards and forwards. In 1991, the Kingdome became even more exciting for me. 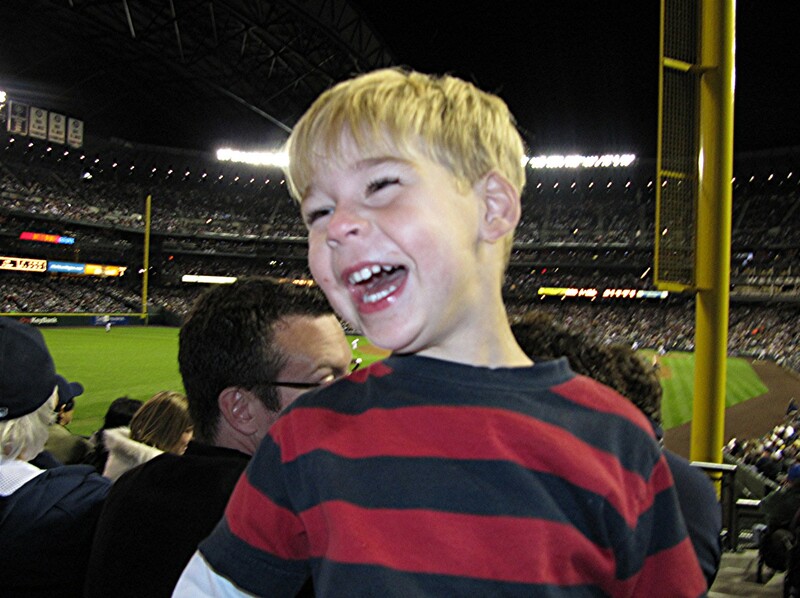 For a 2-3 year span, my family’s partial season ticket plan landed in an interesting spot – about 3 feet from Ken Griffey, Jr.’s good friend and Seattle Rap Legend, Kid Sensation (a/k/a Xola Malik – pronounced “Ko-Lah”). 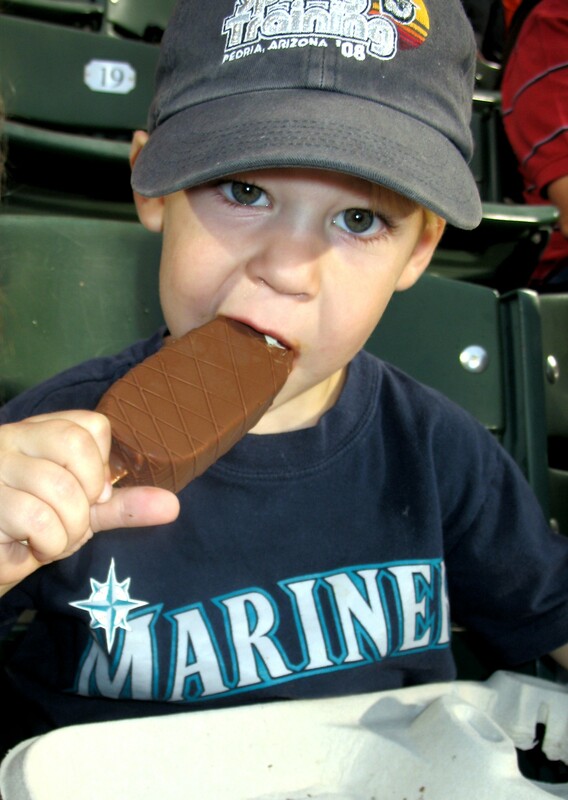 When I was growing up in the 80s, we would go to 10-20 Mariners games each season. In 1991, my parents decided to get the 20-game plan. 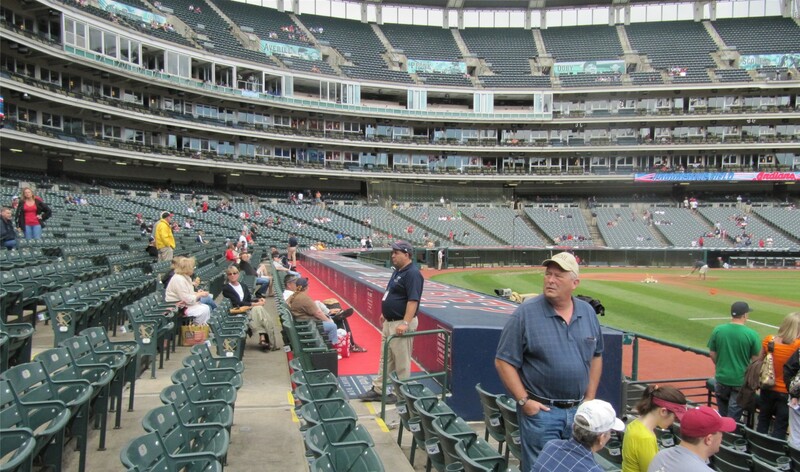 We were in the second row behind the visitors’ bullpen (3B line) in the first four seats on the right side of the aisle. Across the aisle in the front row, there were two guys in their early-20s who always seemed to be having a great time. One of them immediately seemed familiar, but I couldn’t place him at first. Before long, I made the connection. I had Kid Sensation and Sir Mix-A-Lot in heavy rotation. 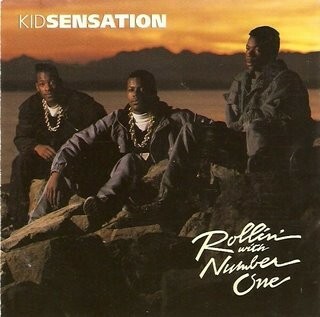 I soon recognized my Kingdome section-mate on the cover of Kid Sensation’s debut album “Rollin’ With Number One.” (By the way, my favorite K-Sen song at the time was “SeaTown Ballers,” check it out here). I seemed to be the only person in the Dome that figured out that we were sitting next to Kid Sensation. And for a teenage guy who was already listening to Kid Sensation’s music it was extremely cool. In 1992, Xola came out with his sophomore album, The Power of Rhyme. I bought it immediately and was psyched to find a track, “The Way I Swing,” featuring the vocal-stylings of the Mariners All-Star Center Fielder. 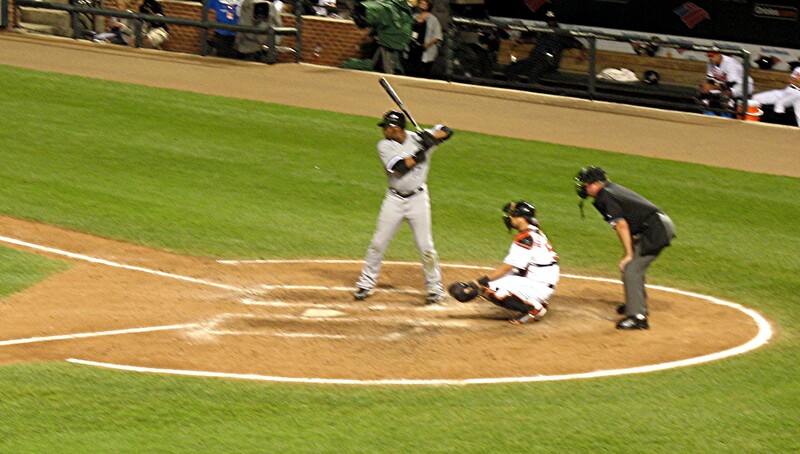 “Swing” is the first episode of a trilogy of Griffey-based songs released by Xola between 1992-2009. 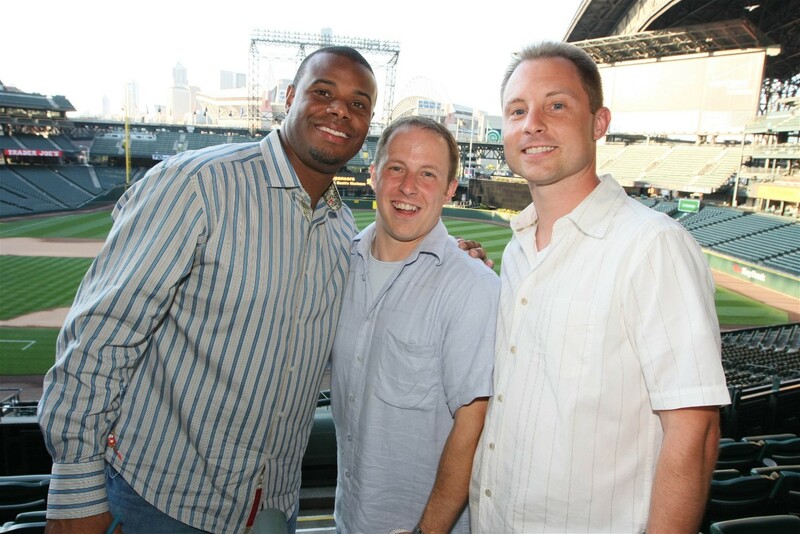 All three are “must have” tracks for any fan of Ken Griffey, Jr. and the Seattle Mariners. “The Way I Swing” begins with Dave Neihaus’s classic call of Griffey’s home run in his first career at bat in the Kingdome. From there, the two friends banter back-and-forth about their mad skills in the batters box and recording studio. (e.g., “One likes to Bat, the other likes to Battle, one from Cincinnati, and the other’s from Seattle, Griffey’s batting average is three-oh-oh and the Kid is undefeated with a dozen K.O.’s”). 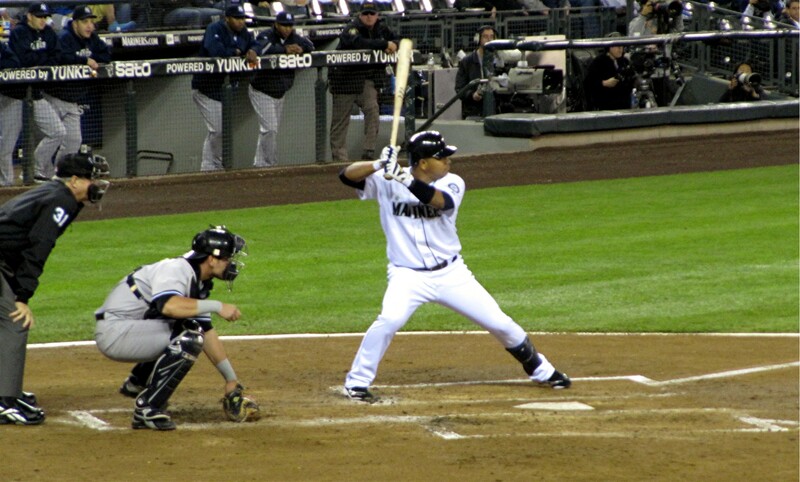 Considering that Griffey undeniably is a first ballot Hall of Famer (he should be a unanimous selection) and one of the best baseball players of all time, it is utterly amazing to me that “The Way I Swing” is not universally known by all baseball fans. So check it out here and download it here – and preview the 2009 remix here and download it here. The second installment in the Griffey-trilogy is 2000’s “Do Your Thing.” “Thing” doesn’t feature Griffey on the microphone, but it offers an unique behind-the-scenes look at Ken Griffey, Jr. “the friend.” Xola pays tribute to Griff’s accomplishments as a Mariner, reminisces about the good times the two shared during Griff’s first stint in Seattle, and offers Griff encouragement and love as he joins the Cincinnati Reds. The song can break your heart as a Mariners fan, but offers a moving glimpse into Griff’s personal life and his decision to return home to Cincy. You can preview “Do Your Thing” here and download it here. You can preview “Back Home” here and download it here. In 2009, Xola has, for the most part, retired the Kid Sensation moniker. He is preparing to release a new album simply as Xola Malik (lets face it, neither Xola nor Griff is a “kid” anymore). Meanwhile, he is a successful businessman (see http://www.henchhench.com), a dedicated philantrophist (see http://www.liveunited.org/music), and a creative producer/performer and actor. The Peanut Man threw the peanuts from the top arrow to Xola standing at the point of the bottom arrow, and nailed Xola in the hands. Sadly, Xola does not quite have the glove Griff has and the peanuts escaped his grasp and landed in the bullpen. (That’s alright though, Griff doesn’t quite have the same skills in the booth as Xola, so we’ll call it a draw). 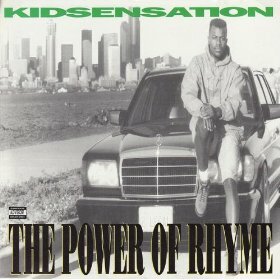 Well, that’s my story of Griffey the recording artist and his friend Kid Sensation. I hope you enjoyed it, and I hope you’ll check out and enjoy these three great Griffey-based songs. Tim and I will be checking out our first second-half game action this weekend in D.C…hopefully they actually play a game this time.